There was a slightly smaller attendance of members than last year (which was at Oxford) when the Central Council met during the Spring Bank Holiday weekend at Exeter. The fine, warm weather made travelling and outside activities pleasant, the Devon countryside looking particularly beautiful. A somewhat limited amount of peal ringing and tower-grabbing was indulged in and a fair amount of time spent with committee meetings, open discussion meetings and similar events. Car tours, a coach tour and several other non-scheduled social gatherings were enjoyed, many non-Council members taking part with members of the local guild and association in Devon. There was a service of Holy Communion at 7.45 a.m. on the day of the conference, the Dean of Exeter being the celebrant. The modern, well-appointed St. George’s Hall, where the Council assembled at 9.30 a.m. on Tuesday, was admirable for such a meeting, and great interest was shown in the model of a bell frame and bells and other exhibits which previously had been on display at a recent Devon county show bellringers’ stand. 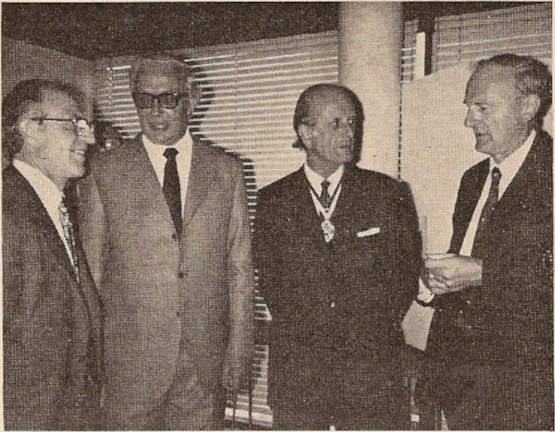 When the members were gathered together, on the call of Mr. Harold Rogers, they received the president of the Central Council (Mr. John Freeman), the Deputy Mayor of Exeter (Cclr. R. H. M. Palmer), the C.C. vice-president (Mr. E. A. Barnett), the president of the Guild of Devonshire Ringers (Mr. Brian Pidgeon), the general secretary (Mr. Philip Jones) and the hon. secretary of the Central Council (Mr. Cyril Wratten). Father Angold led in prayer, following which the president introduced the Deputy Mayor, who firstly apologised for the inability of the Mayor to attend as he was returning from a visit to Exeter’s twin city in Germany. Cclr. Palmer spoke of the attractions for visitors in Exeter, of the modern hall where they were then assembled, the old Guildhall in which the city council meets and of the significance of the Central Council visiting Devon during that Guild’s centenary year. He gave the gathering a warm welcome on behalf of the local citizenship and wished every success to the conference. Mr. Freeman expressed the Council’s thanks to their distinguished visitor and congratulated him on the many beautiful and historic buildings in the city. The Deputy Mayor then retired to attend to other civic business appertaining to his office and the Central Council proceeded with the matters requiring its attention. Following a period for luncheon at 12.30 p.m., the afternoon session resumed at 1.45 and was completed by 4 p.m.
Leaving headquarters on Bank Holiday Monday a 40-seater coach with only two or three seats spare toured around calling at various churches where some excellent ringing was enjoyed. The Devon Guild president (Brian Pidgeon) was in charge of the “travelling” whilst the ringing was organised by Denis Bayles. Ottery St. Mary, with its two separate towers, both of which at one time had rings of bells, was first visited and the greatest interest was shown in this historic church. Sidmouth was looking at its best and several of the party were seen enjoying a walk on the promenade, whilst others went straight to the tower. Ernie Rowe was happy to welcome the visitors and to see them on their way. It was proposed to partake of a ploughman’s lunch at a pub (which had agreed to accommodate the party), but after 10 minutes everyone left, the place being packed with holiday-makers. Only two of the whole coachload managed to get a pint, but following this disappointment - and a natural thirst being uppermost - the trip was continued to Seaton, where enough restaurants and hostelries were found. Seaton’s parish church is right away from the sea and the setting is excellent. Whilst the energetic rang to their heart’s content, others found a local cricket match in action and the perfect English occupations, cricket and bellringing, satisfied everyone. In addition a local band was heard and two companies of “majorettes”, the young ladies dressed in matching outfits, gave a display as they marched to a church fete in a nearby field. Sidbury, Collaton and Axminster towers were also visited, and at the latter the vicar (Preb. J. W. G. Molland, C.F.) spent some time chatting to several of the ringers, his stories of life in Devon being highly amusing. The journey back to Exeter was enlivened by the contingent from Cornwall - as usual seated in the rear seats entertaining with some characteristic songs, the harmony being excellent. Headquarters were reached at 6.20 p.m. - a little late for the start of the committee meetings. Nevertheless all was accomplished in time for the Guild reception which was scheduled for 8 p.m.
St. David’s Hall, Halden Road, Exeter, was the venue for the official reception of the Central Council by the Guild of Devonshire Ringers on the Monday evening. Several strangers to the town found some difficulty in locating the hall, there being an abundance of churches (and presumably church halls) in Exeter. There were plenty of refreshments laid on, a buffet having been prepared, wine or coffee being liberally supplied. This was possibly one of the highlights of the social side of the weekend, for everyone had an opportunity of meeting and exchanging views on a variety of subjects. During a short interval the president of the Devon Guild (Brian Pidgeon) extended a warm welcome to the Council, its members and the other visitors, the reply being made by the president of the Council (John Freeman) who thanked the ringers of Devon for their kindly greetings. This fine collection of books and pamphlets is housed at the home of the librarian, Mr. Frederick Sharpe, at Launton, Oxford. He has looked after it, catalogued it and built it up to magnificent proportions, and the thanks of all ringers are extended to Mr. Sharpe. It has been suggested that a more permanent and accessible home be found for the library and a committee is investigating the matter. At the recent Central Council meeting it was stated that there was a considerable amount of slackness on the part of borrowers of books in returning them, and one person had, in spite of many requests, kept a volume for four years. Several books had been on loan for two and three years, and it was suggested that the names of these borrowers be printed in The Ringing World. However, within a week of the C.C. meeting five books outstanding for long periods had been returned, with apologies, and we trust all others which have been out for overlong periods will, now be sent back to the librarian. One of Mr. Sharpe’s problems has been tracing the borrowers. When applied for and loaned out, a proper record has been kept, but after a few months a reminder has been sent and sometimes the letter returned marked “gone away”. This does cause difficulties. All ringers who borrow the Council’s books are morally responsible to return them without undue delay and certainly to inform the librarian of any change of address. It may be necessary to demand a deposit on the more valuable volumes, but even this does not help for some books are irreplaceable and out of print. Whatever decisions are eventually reached and wherever the library is housed, it will be vitally necessary that books out on loan are not lost sight of and that borrowers are carefully screened. In the meanwhile, let the librarian have back that overdue volume … NOW! Invitations to the Central Council to visit different places in the years ahead came from several Associations. In 1975 they will meet in Lincoln, whilst in 1976 Hereford will welcome the Council. Derby and Durham both seek to entertain the C.C. in 1977, whilst in 1980 the Winchester and Portsmouth Guild have their centenary and would like the meeting to take place in their area. Salisbury Guild last year extended a welcome to the Council in 1982 and that year also the Bedford Association will celebrate their centenary. There was laughter when one member said that the year 2005 should be booked for the Council’s meeting in one area, but Sussex C.A. issued an invitation to the Council for 1985. This date, like the others, was noted. Mr. Bill Theobald’s absence from the C.C. meeting was noted with regret, as he was elected last year to represent the N. American Guild. He was unfortunately in hospital but sent good wishes. However, Marjorie Batchelor (Washington) and J. Michael Simpson (secretary/treasurer, N. American Guild) were present and all ringers were pleased to meet them. Mr. Walter (Basingstoke Lark) Ayre was at the meeting and looking extremely fit. Walter had been out in the sunshine by the look of his face and no doubt enjoyed meeting his many friends in the Council. Mr. Philip Jones (Devon Guild secretary) had a busy time at the outset of the conference. He carried a “wandering” microphone around the room so that when members spoke their speech could be heard through the loudspeakers. However, at one period it appeared that something had gone wrong and Philip was thus relieved of this onerous operation. A new member from Kent, Mr. D. Paul Smith, criticised the Council for being late in getting down to organising a committee on Redundant Bells and said that the Kent C.A. had done a considerable amount of work within the county. He somewhat lectured the Council and said they were not going to be permitted to interfere in affairs in Kent. After a period of silence, the Rev. John Scott brought laughter when he rose and said he perhaps ought to apologise on behalf of the Council members who were not fortunate enough to be born or resident in Kent! Another Kent representative, Mr. Ian Oram, let everyone know that he reads the Church Times. Why, he asked, did the Bellfounders’ Page contain extracts from Church Times. It had nothing to do with bellringing! However, the editor suggested that as we are or should be church bellringers, and many did not take the C.T., paragraphs of a certain character were eminently suitable for the R.W. In any case it was sometimes difficult to get enough for the Bellfounders’ Page, and perhaps those who criticised would endeavour to supply suitable copy. When Mr. Randall (Coventry Guild) asked if anyone was amused at the cartoons and drawings that appeared periodically in the R.W. the editor replied that as ringers supplied them obviously some of them enjoyed the cartoons. Mr. E. A. Barnett (Kent C.A.) deplored their appearance, however, and the editor suggested that if the general readership did not want them he would cease to print them. He had no particular feelings on the matter. Mr. Gordon Halls (Derby), who enjoys making derisive comments at the expense of others, delighted the assembly with a rapid recital of the various delays in publication of replies to correspondence. “Mr. Pipe wonders …” he quoted, and five weeks later he was still wondering as no replies had been printed. However, eventually a letter was printed. On another occasion one of his (Mr. Halls’) friends had replied to a letter which he believed took about three weeks to appear. Replying, the editor said proof of posting was not proof of delivery and in any case could Mr. Halls prove that his acquaintance had in fact written and posted the letter at the time he stated? If it were like many correspondents - particularly peal ringers - it took several weeks before getting down to it and sending in the details. However, the point was noted for the future. In the peals analysis report a typing error caused considerable amusement when it was pointed out by Mr. W. Exton. The title should be the Guild of Post Office Ringers - not Guild of Post Office Workers, as printed, said Mr. Exton. When Mr. Baldwin held up a binder containing computer sheets to show what he had collected during his work on the committee, the president said Mr. Baldwin looked as if he were selling wallpaper - a comment which brought much laughter. In family life a common interest helps to keep parents and children together, to the mutual enjoyment and pleasure of all. Bell-ringing, we know, is one such family interest. Mrs. Beryl Reed is a C.C. representative for the Southwell D.G. and with her husband Colin, daughter Annette (13) and son Malcolm (14) was at the recent meeting at Exeter. The family ring at Balderton, near Newark. Ringers from overseas were welcomed at the Central Council meeting over the Spring Bank Holiday. 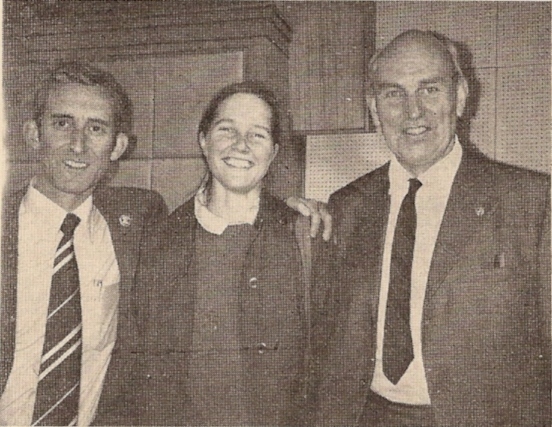 L. to r.: J. Michael Simpson, sec./treas., N. American Guild, from Calgary, Alberta, Canada, Marjorie B. Batchelor, who was for a period in Washington, D.C., and is now at the University of Warwick, Coventry, and Fred E. Dukes, of Drogheda. Co. Louth. Eire. Taking it easy in the sunshine outside Sidbury Church, Devon, several well-known ringers who took part in the Bank Holiday tour by members of the Central Council. Representing the Scottish Association on the Central Council, Miss K. M. H. Branson was at the meeting at Exeter with her friend Dr. Jean Weddell (a new representative for the London C.A.). Miss Branson, until her retirement, was also in the medical profession and served the community as a surgeon. In pensive mood: two well-known and much respected leaders in the Exercise enjoy the sunshine and scenery at Sidmouth, Devon, on Spring Bank Holiday during the coach tour organised by the Devon Guild. Mr. W. Butler, general secretary of the Oxford D.G., read the following paper to the open meeting in the Chapter House, Exeter, on Sunday, May 26. Firstly I intend to describe briefly how restorations have been financed in the past, then deal with a typical current restoration fund and finally what we in the Oxford Diocesan Guild envisage in the future. As an example of how restoration was carried out in the 17th century, I can quote my own parish of Thatcham. Here, in 1621, the three old bells were sent for recasting to Henry Knight’s foundry at Reading. To cover the cost of this the churchwardens levied a rate on all the parishioners to raise the £30 required. It would solve all our problems if the local council included bell restoration on the rates alongside sewage and education, but I feel sure that there would be some opposition. In the Victorian era it was possible to find wealthy people who would bear the cost of restoration work, even to the extent of providing completely new rings. One of The Bell News contains a list of work carried out by John Taylor during the preceding two years. It showed that out of 23 rings, of bells supplied, one of three rings of ten, nine of fifteen rings of eight, one of two rings of six and one of three rings of five had been given. Thus out of a total of 23 rings of bells over half had been the result of one man or woman’s generosity. Individual bells were, of course, far more likely to be donated: for example, the Rev. F. E. Robinson gave five away during his lifetime - two tenors to Appleton, a treble and a tenor to Drayton and a tenor to Stonesfield, Oxon. Another favourite way of raising money for restoration work is by an appeal. With the coming of The Bell News a wider audience could be reached. In 1900 the churchwardens and villagers of Harlow, in Essex, decided that they would install a ring of eight to commemorate the 25th anniversary of their Vicar’s connection with the parish. They placed an advertisement in The Bell News for several months to give an opportunity for all those who wished to contribute. The Editor of The Bell News decided to give this greater prominence and in an editorial article posed the question “Can the Exercise help such movements as this in any way?” He suggested that if the apathy of ringers for such objects could be overcome - and there were signs that the proverbial unconcern of change ringers was wearing off - then they could assist in a material way. The answer was clear; if every one of the 30,000 ringers in the country would send a shilling to Harlow then there would be enough money subscribed, with sufficient left over to start a fund for any similar undertaking in the future. “Plain Speaker,” one of the regular columnists, suggested that if ringers saved one penny a week on a Post Office Savings Card and then sent the card to the Harlow churchwardens to arrive on November 1 he would give a ring of 12 handbells to the first opened. This inspired the Editor of The Bell News to offer another set, and later the two churchwardens offered two more. The total amount contributed by the ringers of Great Britain to the fund, after this inducement of four rings of handbells, was £16 9s. Three hundred and twenty-nine ringers contributed one shilling each towards the total cost of £600. A similar scheme was proposed the following year when the Dean and Chapter of Exeter Cathedral decided that the bells should be rehung, as it was taking 16 men to swing the bells for a short time. The cost of rehanging was £1,000, of which £500 was available. The Rev. F. J. Coleridge of Cadbury suggested that each of the 550 parishes in the diocese should contribute at least ten shillings. I don’t know what the response to this appeal was - the money was raised eventually. The idea of restoration funds gradually evolved in diocesan and county associations. I don’t know which guild first started one; the Oxford Diocesan Guild’s dates from 1924, and the Yorkshire Association’s from 1940. Ringers even then held very divergent views on the establishment of restoration funds. Many thought that it was the duty of church and parish to keep the bells in good order, and that ringing associations should not interfere. John Goldsmith, in an editorial article in one of the war-time issues, put forward the opinion that a grant from a guild restoration fund was far better than perfunctory aid given by individual ringers, for it came in the name of all the members and brought with it the greater weight of recognition. The Oxford Guild’s restoration fund celebrates its golden jubilee this year, and in the 50 years it has given 122 grants totalling £2,552. Cash reserves now stand at just under £2,000. Quite early on it was decided that a fund built up purely by collections taken at meetings and services would not be adequate, if only for the reason that the burden would only fall on those keen enough to come to them. Each year 25 per cent. of all the honorary members’ subscriptions were transferred from the general fund. In addition to this, about 30 years ago an appeal was made to each P.C.C. in the diocese to support the fund by sending an annual contribution to it, depending on the number of bells in the tower. The response is not large - about 25 per cent. of the 356 towers in the diocese take part - but it is a regular source of income. I should now like to describe the new fund we are setting up in the Oxford Diocesan Guild. This was the brainchild of Mr. Henry Lawrenson, of Newbury, and I should like to thank him for his advice and help with this section. We all know that the responsibility of maintaining the bells in our churches lies with individual P.C.C.’s. Many of these are hard pressed to make ends meet, and find that their income is insufficient to cover the day-today running expenses of the parish. Any restoration work is regarded as a major disaster, and bells are, more often than not, left to the very bottom of the list. What we hope to do is to establish a Capital Fund, and use the income to relieve P.C.C.’s of the financial responsibility of bell restoration. To maximise this income it is proposed to register the Fund as a charity, and the draft rules have been approved by the Charity Commissioners. The amount of any grant would depend on the Governors of the Fund, but it is hoped that eventually 100 per cent. grants would be possible. (b) the ability to raise the sum. A good guide to (a) is the present expenditure on restoration work in the diocese; that is the money required to complete work being undertaken either by P.C.C.’s or by individuals with the recognition of the P.C.C.’s. At present in the Oxford Diocese this is in the region of £10,000 per annum. This would indicate that a Capital Sum of some £100,000 is required. This sounds a formidable sum of money to raise. Let us now see if it can be done, in theory if not in practice. First, some facts; the Oxford Guild has a membership of approximately 2,000, and the 356 towers with more than five bells contain round about 2,000 bells. (i) The responsibility for maintaining the bells lies with the P.C.C. and they are obviously going to derive most benefit from the Fund. Thus they should be asked to contribute either in the way of insurance or deferred repairs. If a P.C.C. wished to “go it alone” and set up its own fund for the upkeep of its bells it would have to set by a sum of £4 to £6 per bell for every year for ever, assuming current prices and rehanging every 50 years, It, would be reasonable to expect them to subscribe a minimum of £1 per bell for a period of ten years. (ii) Ringers run a close second to the P.C.C.’s in deriving benefit from the Fund. Most associations’ objects specify the teaching of ringers so that our art may be handed on to the next generation. Without the bells being available this is all rather pointless, and we ought to ask ourselves how much we value the future of ringing. As much as a weekly visit to the cinema £30 per year? Our daily newspaper £15 per year? A pint of beer after a weekly practice £10 per year? A cigarette after each service and practice £3 per year? Only 41% have been taken into account, for there are some who are retired, others who are fully committed and some who are not yet earning. We hope that the latter will join in at a later date. Most, if not all; will be paying tax, and if they should subscribe under a deed of covenant then their effective contribution will be increased by almost 50%. (iii) The last group is the General Public. Despite the letters of criticism and complaint that appear in many newspapers, there is a wealth of goodwill towards the sound of bells throughout the country. Many reflect with nostalgia when reminded of the sound of bells floating across river and meadow, and expect them rung on national days of rejoicing and other ceremonial occasions. These are prepared to contribute. Members of the public can, of course, contribute under deed of covenant; bequests under wills may also be made. Provided that bequests to charities do not exceed £50,000 in aggregate they are an allowable deduction before computing Estate Duty. I’m sure that many people would sooner leave money to a bell fund rather than see it go to the Collector of Taxes. Many companies regularly make donations to charities. If approached, some of them would support the scheme. A word of warning should be given about deeds of covenant by companies - in the case of close companies they should seek advice, from their accountants before completing them. Summarising the sources of income, the P.C.C.’s would subscribe £2,000 per annum, ringers £6,000 per annum, and the general public £2,000 per annum. This would give over a ten-year period the capital sum of £100,000 required. These views, I must say here, are those of Mr. Lawrenson and myself, and should not be taken as representing those of the governors of the fund. However, the officers and general committee of the Oxford Diocesan Guild are confident that the scheme is practicable and hope to go ahead as soon as possible. The open meeting this year held in Chapter House, Exeter Cathedral, on May 26, was again well supported, between 150 and 200 members and ringers attending. After Philip Corby had commented on the comprehensive appraisal made by William Butler (Oxford D.G.) in his initial address, he brought the meeting’s attention to the memorandum of the Committee for Redundant Bells, compiled by Dennis Beresford. This “monumental undertaking” proved very interesting reading, providing comparisons of the situations in many different associations. Mr. Beresford had asked, though, that several points should be made clear: (1) that the Survey applied to England only, (2) that certain individual restoration efforts (like the Chester Guild’s fund for its Cathedral) must be considered separately and (3) that the investment market at present is at a very low ebb. The current inflation rate so far as normal maintenance is concerned runs at about 20% per annum. The subject was then offered for general discussion, Mr. Corby skilfully controlling the relevancy and direction of the speakers, when occasion demanded. Mr. J. Diserens said that although the scheme had his whole-hearted support, he was worried that if inflation rates continue on their present levels, the interest accruing from the capital fund invested would prove an insufficient return. The money in hand should be spent before its purchasing power falls even further. Several members queried the wisdom of setting up such a large sum of money. From the memorandum Mr. D. Beacham saw that many associations have small capital funds which result in small grants being made. This is a waste; one answer is the Oxford D.G. scheme (i.e. grants from income) or alternatively to spend the capital now. A great saving can be made in many cases if advantage be taken of local labour. The Bell Foundries are very willing to adjust their estimates accordingly. Mr. Black wanted to know the value of registering such a scheme as a charity. Registration means that all the income is available for grants as it is no longer subject to tax (F. E. Collins). The Hertford C.A. has registered its Bell Repair Fund as a charity but is keeping control of its other moneys; it is possible to transfer money from the general fund to the Bell Repair fund. Mr. C. Groome reported the success the Peterborough Guild had had in registering the whole Guild as a charity and the Bell Fund as an associate charity. There had been no problems with the Charity Commissioners over the use of money for the usual administrative expenses (i.e. reports, wreaths, etc.). The registration has resulted in a 5% increase in interest and this is nearly equivalent to the amount collected annually for the Bell Fund alone. More money is being obtained from service collections and initiative efforts (like raffles, etc.). The affiliation scheme secured more money from P.C.C.s when they were asked to make a donation rather than pay a fixed amount. Collections in the tower were made at all practices and meetings and covenants are a boon; for every £1 covenanted about 50p can be claimed back from the Inland Revenue. So far as local industry is concerned, expenses of £7-8 incurred in seeking support reaped about £20 in donations. On the whole the Guild prefers the “pay as you have” system and now tries to make grants of 10% of the cost. Mr. Anderson indicated that success or failure with the Charity Commissioners depended a good deal on the individual official involved! It was also pointed out that the Commission does run very helpful schemes; it has its own Unit Trust arrangement and can also pay interest gross to investors, reclaiming the tax refund itself. So far as paying income tax is concerned it is apparent that a case of “what the Inland Revenue does not see it does not wish to know about” exists. The administration of a large capital fund would be limited to investments in Equities and Trustee Investments by the trustees, themselves bound by the terms of the document creating the trust. The Barron Bell Trust should not be overlooked, said Mr. Anderson, and certainly no one but a broker should handle a portfolio of the size envisaged by the Oxford D.G. scheme. An aside was made that no association treasurer would be capable of the job and the meeting was reminded that the Aberfan Fund’s considerable shrinkage has caused very bad feeling locally. The importance of having competent and skilled people in charge must be stressed. Dr. Baldwin noted from the memorandum that several associations have made swift and dramatic increases in their capital and he sought an explanation for the wizardry. Mr. Wratten explained that the Gloucester and Bristol Association has increased its subscriptions to £1, of which 50p goes into the Bell Repair Fund. They do not consider it advisable to make collections from ringers in the tower at meetings for this throws an unfair burden on the small proportion of ringers attending. Higher subscriptions have not resulted in a loss of members and the affiliation fee for P.C.C.s is successful; they know that they are entitled to a grant as of right. The Winchester and Portsmouth D.G., said Mr. Savory, have launched a pilot scheme, registered as a charity, whose capital has grown to over £1,000 in less than two years. This had been achieved through collections, covenants, peal fees and sponsored events. The Suffolk Guild and Kent C.A. have also increases to their credit, the former having instituted a fee of 10p for each rope in every peal attempt, without suffering any decrease in peal ringing, said Mr. H. Egglestone. The question of distribution of grants brought the meeting’s attention belatedly back to the church, which should after all take precedence. Mr. Beresford commented on the very serious issue of redundant bells; when a church becomes redundant, its fittings are vested in the Diocesan Board of Finance and are disposed of as the Bishop instructs. Any bell is of value to the church for its scrap metal at least while ringers think constantly in terms of augmentation. A bell restoration fund must concern itself with anyone wanting bells. There is too great a gulf between the church and ringers, said Mr. Anderson. To ensure the correct use of a grant, the agreed precedent is that the money is only handed over upon satisfactory completion of the work, although applicants are told that an award will be made subject to the work being done. Self-help can give a fillip, said Mr. W. Simmonds. So can use of the medium every town has - its local paper, which can be relied upon to give good publicity at the right time, commented Mr. J. P. Fidler. Naturally it would be a bad thing to undermine the parish’s prerogative, but the gift of even a small sum can be a great impetus to a struggling church. Concern was expressed about a possible conflict of interests between parishes and separate charities, said Mr. P. Gray. Mr. Butler was asked to comment on his reactions to the discussions. These were that thinking in larger terms could bring in bigger and more generous donations; that the fear for the loss of P.C.C.s’ prerogative was unfounded - there is no intention to interfere with the present system. He was surprised that no-one commented on the question of raising more money from ringers themselves, who he thought should bear some of the financial burden of the bells. A “stewardship” scheme among the ringers had been very successful in his own tower to raise the balance of moneys needed to augment, the bells to a ring of 10. It is hoped that the meeting will result in far more serious thinking about this problem. Generally the assembly did give the impression of muted antipathy and trepidation to so radical a scheme as that proposed for the Oxford Guild. It may be too grandiose and not the solution, but it should provide a launching pad for more open-handed dealing between ringers and the church so that our reputation for parsimony may be outlived one day and our reluctance to look at bells through the church’s eyes may decrease in intensity. For the future of the Exercise we must think more objectively and constructively on restoration and redundancy. Our ringing rooms are not “Castles in Spain” and we should aim for unity with the church instead of protecting our ostracism so fiercely.- J. B. The report in this issue of the Open Meeting at Exeter during Bank Holiday weekend makes interesting reading. Those who attended - and there were nearly 200 - will know that, following the paper read by Mr. William Butler, general secretary of the Oxford D.G. (this paper is also published in full) there was a very full and lively discussion, the lead being given by the chairman for the evening, Mr. Philip Corby. Many and varied were the suggestions put forward and we hope that our readers will also find something to stimulate their ideas for the benefit of restoration funds. No decisions or conclusions were made: that was not the purpose of the meeting, but there is no doubt that the gathering benefited from the debate. We hope that guilds and societies will also benefit from the experience if and when they hold local meetings to discuss the problem. What a pity more open meetings of a similar character cannot be organised! But let us at any rate ensure that the Spring Bank Holiday discussions continue. During the latter part of the C.C. meeting, Christopher Windsor (aged 11) was discovered sitting on a ledge about 18 inches wide, which ran around the perimeter of the landing, outside St. George’s Hall, and at about nine feet from the floor! Nobody but he knows how he got there, or how he got down! Perhaps he was bored with the proceedings. The 77th Annual Meeting of the Central Council was held on Tuesday, May 28th, in the St. George’s Hall, Exeter. The President, Mr. John Freeman, presided. After Fr. Paulinus Angold, of the Guild of Devonshire Ringers, had opened the meeting with prayer, the Deputy Mayor of Exeter, Councillor R. H. Palmer, welcomed the Council on behalf of the Mayor and Citizens of Exeter. He apologised for the absence of the Mayor, who was in Germany, and said how pleased he was that the Council had chosen to come to Exeter, particularly as 1974 marked the centenary of the Guild of Devonshire Ringers, to whom he extended his congratulations. In his reply, the President thanked Councillor Palmer on behalf of the Council and said how pleased the Council was to visit an ancient city. He admired the care the City Council was so obviously taking of its heritage, and wished Exeter prosperity. Speaking personally, he commented on how unusual it was for a Mayor to come to see a Borough Surveyor and Engineer, rather than the other way round (laughter). The Secretary (Mr. C. A. Wratten) reported that 65 societies were affiliated to the Council, with 169 representatives; the Rules provided for 24 honorary members, and there were 10 Life members - making a possible membership of 203. There were two vacancies. All subscriptions had been paid. Apologies for absence were received from Messrs. B. Austin, B. E. Bartlett, E. Billings, N. Chaddock, R. H. Cook, J. W. Cotton, Mrs. S. M. Drew, Mr. J. Dunwoody, Canon K. W. H. Felstead, Dr. C. M. P. Johnson, Messrs. B. Jones, A. J. Martin, J. R. Mayne, D. Mottershead, J. R. Norris, F. W. Perrens, G. W. Pipe, A. E. Rushton, Revd. R. D. St. J. Smith, Mr. and Mrs. P. J. Staniforth, Messrs. W. Theobald, W. H. Viggers, F. A. White, T. W. White, A. T. Wingate, and Dr. A. V. Woodcock. Commenting on the absence of Mr. Theobald, who represents the North American Guild, the Secretary said how pleased he was that both Mr. M. Simpson of Calgary, Secretary of the North American Guild, and Miss M. Batchelor of Washington were able to be present in the hall (applause). The President welcomed seven new representative members of the Council - Messrs. G. E. Bonham (Ely Dioc. A. ), D. McEndoo (Irish A. ), G. Penney (Hertford County A. ), D. P. Smith (Kent County A. ), D. R. Jones (Lancashire A. ), A. M. Glover (Leeds Univ. Soc.) and Dr. J. M. Weddell (London County A.) - and said that he hoped they would find its meetings valuable; he felt sure that they, in their turn, would have something to contribute. The Secretary said that seven of the present honorary members - Mrs. O. D. Barnett, Sir John Betjeman, and Messrs. B. Austin, F. E. Collins, C. K. Lewis, J. R. Mayne and W. A. Osborn - retired this year. Although all were eligible for re-election, Mr. Osborn had expressed his willingness to retire. There was also one vacancy. Mr. Wratten felt that it would be wise to retain one or perhaps two vacancies in order for the Council to be able to retain the services of any member who might not be re-elected by his own society to serve on the new Council next year. Mr. F. E. Dukes (Irish A.) then proposed, and Mr. T. J. Lock (Middlesex C. A.) seconded, the re-election of the retiring members, less Mr. Osborn. Mr. C. J. Groome (Peterborough D. G.) proposed the election of Mr. Harold Chant. Mr. Chant was, he said, perhaps better known to readers of The Ringing World as “the Professor”; he had done much for ringing and, as he was about to retire, he would shortly be able to devote more time to ringing. His presence would be a great asset to the Council. Mr. R. Brown (Yorkshire A.) seconded, and the seven nominees were elected. The Revd. J. G. M. Scott (Devonshire G. and chairman of the Towers and Belfries Committee) expressed the Council’s gratitude to Mr. Osborn for his services to ringing over many years, and particularly for his advisory work on bells in Somerset. His remarks were seconded by Mr. F. Sharpe (Life member and former chairman of the Towers and Belfries Committee), who said that for a period after the last war Mr. Osborn and he had together borne the brunt of the Towers and Belfries Committee’s work. It was agreed that the Secretary of the Council should write to Mr. Osborn to express the Council’s appreciation of his work. The Council stood in silence while the President read the list of past members who had died since the Council last met: Miss E. M. Steel (Ladies Guild 1938-51, died May 30, 1973), Messrs. A. Harman (Guildford D. G. 1936-57, died Oct. 2, 1973), W. N. Park (Durham and Newcastle D. A. 1948-60, died Nov. 16, 1973), J. E. Bibby (Chester D. G. 1948-50, died Jan. 11, 1974), Mrs. A. E. Richardson (Ladies Guild 1932-62, died April 9, 1974), and Messrs. E. H. Mastin (Ely D. A. 1948-53 and 1960-73, died April 11, 1974) and G. E. Fearn (St. Martin’s Guild 1954-1973, died May 20, 1974). The Revd. J. G. M. Scott then said a short prayer. The Secretary proposed the adoption of the Minutes of the 1973 meeting at Oxford as published in The Ringing World of 22nd March 1974 and circulated to members. After Mr. E. A. Barnett had seconded, the Minutes were accepted without dissent. Arising from the Minutes, the Secretary said that the question of the date of the 1975 meeting would be dealt with under item 9 of the Agenda - Future Meetings. Mr. G. Dodds (Hertford C. A.) pointed out that the Minute on the Balance Sheet and Accounts said that Mr. Wilson had undertaken to ascertain on what a Ringing World tax liability of £253 was based. Mr. W. G. Wilson (Chairman of the Ringing World Committee) said that he had promised to let an enquirer know on what the tax was based; this he had done in a letter last June, but had received no acknowledgment. The tax situation was that the Council was treated as a mutual trading body, and as such was taxed on any profits at the rate of 1%. Donations were not liable to tax, but the full Corporation Tax was levied on any income from dividends. Towards the end of last year the Sheffield and District Society ceased to exist as a separate body, and was amalgamated with the Yorkshire Association. The Society consequently ceased to be affiliated to the Council, which now consists of representatives of 65 societies in England, Wales, Scotland, Australia, New Zealand and North America. In addition to the loss of the Sheffield and District Society’s representative since 1969, Mr. J. Seager, the Council has lost two serving members by death. These were Mr. E. H. Mastin, who had represented the Ely Diocesan Association on the Council since 1948, and Mr. G. E. Fearn, the St. Martin’s Guild representative since 1954. Four members have resigned since the last meeting: Messrs. P. W. Brown (Irish Assocn. since 1969), M. H. D. O’Callaghan (Kent County Assocn. since 1972), N. Bennett (Lancashire Assocn. since 1969), and R. Green (Leeds University Society in 1973). In thanking them for their services, I am pleased to welcome their successors - Mr. G. E. Bonham in place of the late Mr. E. H. Mastin, and Messrs. D. McEndoo, D. P. Smith, D. R. Jones and A. M. Glover in place of those who have resigned. I must also welcome two further new members, G. Penney and Dr. J. M. Weddell, who have replaced Messrs. W. Ayre and W. G. Wilson as representatives of the Hertford C.A. and the London C.A. respectively; the two latter were of course elected Life Members of the Council at the 1973 meeting in Oxford. I have little to report on correspondence during the past year: it continues to be prolific but largely routine. However plans for the reissue of the late Ernest Morris’s “History and Art of Change Ringing”, mentioned in my last report, have been pursued by E. P. Publishing Ltd. of Wakefield. The original intention was to publish it this spring, but this was thwarted by the three-day working week. It is now expected to appear in the autumn. Commercial considerations have meant that the publishers could not consider any revision or up-dating of the text, and the book will thus be a direct copy of the original 1931 edition. There is little progress to report on the new Council Handbook. I consider it important that it should contain at least an outline of any recommendations that arise from the work of the Committee for Redundant Bells, and it is still too soon for these to be ready. In the meantime copies of the Council’s Rules have been duplicated and circulated to all members of the Council; copies will also be sent to the secretaries of all affiliated societies. Cyril A. Wratten, Hon. Secretary. Adoption of the report was proposed by Mr. C. A. Wratten, and seconded by Mr. E. A. Barnett, (Life member), the Secretary emphasising that no criticism of the Committee for Redundant Bells was implied in the final paragraph. Mr. F. E. Dukes queried the omission of Ireland from the list of countries represented, and enquired whether the Irish representatives were no longer considered members (laughter). The President said he was tempted to say he was sorry but they were (renewed laughter). The year 1973 saw a marked increase in the number of books borrowed from the Library. The total was more than treble that of 1972. Correspondence was more extensive also; and to cope with the numerous requests for copies of entries in the older books I bought a photo copier (my property - not that of the Council). While in many instances copying is easier than dispatching books on loan it is often very time-consuming. In regard to equipment: apart from buying two files each year for the correspondence the Council has not spent anything over the past 30 years on equipment for the Library other than the purchase of six packing case type bookshelves. What little there is has been provided by me. I consider it would be wise for the Council to make an annual allocation for the purpose of Library files and equipment. I am always happy to arrange facilities for anyone to examine books at my home; but ask for as much notice as possible. Arrangements can be made also for anyone to examine that portion of the Library which is housed in Caversfield Church: it is essential however for me to meet visitors there as the church is isolated and security arrangements are necessary. I have been obliged to write asking for the return of books much more than in past years: this is also very time-consuming and unproductive; and I appeal to all users of the Library to return books promptly. At present, in three instances I have a queue of prospective borrowers for books kept by others for unreasonably long periods. For purposes of insurance I have again valued books for Associations. As books on bells continue to rise in value rapidly, I suggest that those I valued during the past two year should be substantially increased in insurance value. At the Council meeting in 1972 it was decided to publish by instalments in The Ringing World a catalogue of books in the Library. In 1973 I reported that “lack of available space has prevented this to date”. This was mentioned by a correspondent in The Ringing World as “my annual statement of inability” to produce a catalogue. There was no catalogue or book list when I took office: during my first year as Librarian I made three catalogues, viz: (1) numerical; (2) titles; (3) authors, all in card index form for convenience. The administrative Committee (Standing Committee) decided no to publish it as so few would require it; and during my term of office only five requests have been received for it. One of these was typical of some others I receive; I was asked for a complete list of the books in the Library as the writer was engaged on research into the early history of ringing; In reply I gave a list of 24 suitable books, and all I was asked to send in return was a copy of “Ropesight”. Arrangements have now been made with the Editor of The Ringing World for the publication of a book list. Ringing Towers, the Journal of the Australia and New Zealand Association of Bellringers. Annual Report of the Bath and Wells Diocesan Association of Change Ringers. Annual Report of the Gloucester and Bristol Diocesan Association of Church Bell Ringers. Annual Report of the Peterborough Diocesan Guild of Church Bell Ringers. Annual Report of the Truro Diocesan Guild of Ringers (Seventy-fifth Anniversary Number). The above-mentioned were presented by their respective organisations. From Mr. Christopher Groome we received a copy of the latest edition of “Grandsire” (Jasper Snowdon Change Ringing Series). In moving the adoption of the report, Mr. F. Sharpe emphasised the need for an allocation of money to purchase equipment for the library; when he was still in business it had sometimes been possible to make use of cast-off files, but this was no longer feasible. He also now had the proofs of the library booklist, which should shortly be published in The Ringing World. Mr. W. H. Dobbie (Soc. of Royal Cumberland Youths) seconded. Mr. W. G. Wilson said that he had referred in The Ringing World of 22nd May to a booklet published 51 years ago and entitled “Why are you a Ringer?”, and had then asked if anyone had a copy. He was pleased to say that Mr. J. Fidler, of Bow, had now given him a copy, which would be placed in the Council’s library. Mr. J. S. Barnes (Soc. of Royal Cumberland Youths) said that the Librarian’s request for financial help should not go unanswered. He was however also concerned about the question of the library’s valuation and insurance, and also that all the knowledge of the library was in the hands of one man. He therefore wished to propose the setting up of a committee to investigate all matters relating to the Council’s library, including such things as its housing and safe storage, insurance cover, loans policy, the desirability of a charge for loans, the purchase of books, and the advisability of setting up a permanent Library Committee. Mr. E. C. Shepherd (Life member) enquired whether Mr. Sharpe was still finding difficulty in getting books back; it was undesirable that books should be retained for long periods. After Mr. Sharpe had confirmed that this was still a problem, Mrs. O. D. Barnett (honorary member) suggested that a list of outstanding books, with the names of their borrowers, should be published in The Ringing World after a suitable interval. Mr. Sharpe said that he would rather not publish such a list, although he would do so if the Council wanted him to; but he might have to refer some cases to a solicitor soon. Mr. B. D. Threlfall (Cambridge Univ. Guild) agreed with Mrs. Barnett, particularly as he thought publicity likely to be both cheaper and more effective than solicitors (laughter). After Dr. J. C. Baldwin (Oxford D. G.) had pointed out that some books might need to be borrowed for long periods for research purposes, and Mr. W. B. Cartwright (the Council’s legal adviser) had assured the meeting that he took no umbrage at Mr. Threlfall’s remarks (laughter), the meeting agreed with Mrs. Barnett’s proposal that a list of offenders be published. Mr. Sharpe said that he trusted a full report of the discussion would appear in The Ringing World for any culprits to see. Mr. J. M. Tyler (Peterborough D. G.) commented that the report showed that only four societies had sent copies of their annual report to the library; was this an oversight? The President said that he was sure that it was only an oversight, but it was one that should be rectified. Reverting to Mr. Sharpe’s request for an allocation of funds, the President enquired whether he had a sum in mind. Mr. Sharpe thought that the Council could afford £20 a year for files and equipment, but Mr. W. Butler (Oxford D. G.) wondered about the purchase of books; apparently not all new books were being bought. Mr. Sharpe confirmed that the money was not intended for books, many of which were being donated. Mr. R. S. Anderson (N. Staffs. A.) then proposed that a grant of £25 be paid to the library this year and, in view of inflation, the sum be reviewed each year. He was seconded by the Revd. J. G. M. Scott (Devonshire G.), and the proposal was carried. Mr. R. Brown said that it was important that the library did not have to rely on donations of books to keep up-to-date, and Mr. W. F. Moreton (Yorkshire A.) suggested that, if a committee were set up as had been proposed earlier, it should investigate the advisability of finding a permanent home for the library, perhaps in one of the London libraries such as Goldsmith’s. Mr. J. E. Camp (Oxford Univ. Soc.) queried on a point of order whether the proposal should not have been a formal motion under Rule 15, but the President said that the Council had the power to appoint a committee if it so wished. After Mr. R. Brown had seconded Mr. Barnes’ proposal that such a committee be set up and should report to the Council as soon as possible, the Council agreed, and Mr. F. Sharpe, Mrs. E. Stevens - a trained librarian - and Messrs. J. S. Barnes and W. T. Cook were elected to serve on it. The Librarian’s report was adopted. The machine has had two “outings” during the year, the first being on January 20th for a party of sixteen ringers from Kent. A plain course of Stedman Cinques was rung, followed by an attempt of London Royal, but this broke down due to a fault in the machine. Touches of Bob Major, Bob Doubles and Grandsire Doubles were rung with some “audience participation”. At the request of Miss Ann St. John Smith, a lecturer on the Science Museum staff, the machine was operated again on July 25th to enable a sound film to be made to illustrate lectures on bell ringing which she gave to young people during the summer holiday lecture series. We hope to acquire a copy of this film. Superlative Surprise Major was recorded. A fault that occurs frequently concerns the starting and stopping mechanism on the handstroke setting box due to wear, and some repair is required. Arrangements are in hand to attend to this. Douglas Hughes, Walter H. Dobbie, Trustees. Mr. D. Hughes (honorary member) proposed the report’s adoption. He said that the film mentioned in the third paragraph was in fact silent. The trustees had now received a 16mm copy, which they had not yet viewed; when they had made an 8mm copy for their own use, they would pass the original to the Council’s library. The fault in the machine referred to in the final paragraph of the report had now been attended to. Mr. W. H. Dobbie seconded. Mr. G. A. Halls (Derby D. A.) said that every year the trustees mentioned that the machine had broken down. Was it worn out? He thought a complete overhaul, replacing worn parts and making the machine more reliable, might be necessary. Mr. Hughes said that he did not consider the machine to be worn out. Anyone was welcome to overhaul it - provided that it still worked afterwards! There were thousands of parts, and the trustees were quite satisfied with its condition. After the meeting had agreed that discussion of The Ringing World accounts should be deferred until the Ringing World Committee’s report was considered later in the agenda, the Secretary drew attention to the small credit balances over the year’s working for the General, Clement Glenn and Publications Funds. In the first case this was entirely due to two things: the royalties received from Kingsmead Reprints on sales of the Tintinnalogia reprints, and the fact that the Oxford Society and the Oxford Diocesan Guild had very generously met the entire cost of room hire etc. at the 1973 meeting. The Council was, he said, very grateful to these two societies (applause). There were no questions on any of these accounts. The Committee met in London in November and in Birmingham in March. On the first occasion 18, and on the second 21, of its 25 members were present. In March the Committee received with regret the resignation, for personal reasons, of Mr. G. W. Pipe, one of its elected members. This resignation together with Mr. D. Beresford’s changed status on the Committee - he now attends in his role of chairman of the Committee for Redundant Bells, rather than as an elected member - means that there are now two vacancies to be filled. Much of the time at each meeting was spent in discussing the organisation of the Council weekend and of the annual meeting, guided by recommendations from the meetings sub-committee (Messrs. Crossthwaite, Gray, Moreton and Pipe), it was agreed that the open meetings at Oxford had been an undoubted success, and that they should as a result continue to be a feature of future meetings. Suggestions of topics for discussion at these meetings will be welcomed by members of the sub-committee. It was also agreed that, in an attempt to make more use of the talents of Council members, the Secretary would next year circularise all members to discover whether they were interested in working with or for any of the various committees. (Since this is the final year of the present Council, there seemed little point in asking members this year, just before societies elect their representatives for the 29th Council. These elections often result in fairly large changes in the Council’s membership). Two papers on the Council’s function - one by Mr. J. S. Barnes (Society of Royal Cumberland Youths) and the other by Mr. P. M. J. Grey (Australia and New Zealand Association) - were discussed at some length, and it was agreed that both merited publication in The Ringing World, albeit for quite different reasons. They consequently appeared in the issues of 30 November 1973 and 22 February 1974 respectively, but drew regrettably little response from readers. In proposing adoption of the Administrative Committee’s report, the Secretary drew members’ attention to the need to fill the two vacancies that now existed on the committee. After Mr. E. A. Barnett had seconded, Mrs. Barnett (honorary member) pointed out that, as this was the final year of the triennium, there would in any case be a new committee elected next year and there was therefore less urgency to fill the vacancies. Mr. F. Sharpe was then elected to the committee on the proposition of the Revd. J. G. M. Scott, seconded by Mr. P. G. Smart (Guildford D. G.), and the second vacancy was left unfilled. Members of the Committee dealt with 172 requests for advice during 1973 - a somewhat lower figure than the previous year’s, but representing a great deal of work. Most of these (though not the last!) involved a member of the Committee in a visit and a full inspection followed by the writing of a full report on tower and bell installation. Only a few could be dealt with by correspondence. Advice was offered unsolicited with regard to the dangerous condition of the bellframe at AMBRIDGE, Bartsetshire. The Producer of “The Archers”, Mr. Charles Lefeaux, promised to bear the matter in mind and so far the proposal to have the frame repaired by a local handyman has gone no further. The subjects on which we have been asked for advice varied widely, with rehanging (52) the most frequent. General reports with no special problem in mind accounted for 19, structural problems 19, routine maintenance 21, augmentation 17, recasting 13, sound control 17, redundant bells 14, general overhauls 9, new installations 4, ringing room 3, historical information and heat-loss through the tower one each. “The Towers and Belfries Handbook” was probably the most important outcome of our year, and by the time this report is presented will be on sale. Winston Churchill once described a camel as “a horse designed by a committee”, and one of the reasons for the very slow progress which the book made since its inception has been the time needed to eliminate (so far as possible) its camel-like properties. Chapters submitted by different members had to be edited to create a homogeneous style; varying technical terms had to be brought into line (we couldn’t talk about a “gart-hole” in one chapter and a “fillet-hole” in the next); many of the drawings had to be re-drawn to give the book an even format. We have been slow, we know, and we’re sorry about it, but when nine authors are scattered all over the country speed is hard to maintain. We ran only hope that what we have produced was worth waiting for; it is a new departure entirely, for nothing of the kind has ever been produced, and we hope that it may help towards a new advance in the maintenance and repair of our towers and their bells. For a publication as well and lavishly illustrated as this, and produced in a handsome format, we do not believe that the price is excessive; certainly not for the professional for whose benefit it is mainly published, and not even for the interested ringer. What we most desire is that every church architect should have a copy on his bookshelf, and we hope that any tower-captain or steeple-keeper who meets the Architect about his quinquennial inspection will open the conversation by asking “Have you a copy of the ‘Towers and Belfries Handbook’?”. It would be invidious to apportion credit among members of a team all of whom helped in the work, but one trying and time-consuming job had to be left to one man, and that was the oversight of the printing and binding of the book, beset as it was by many snags and problems, and troubled by shortages and three-day working. This was left to Fred Sharpe, and he deserves our special thanks. During 1974 we intend to set in hand the publication of the relevant parts of the “Towers and Belfries Handbook” as a new maintenance handbook. We regard the educational side of our work as being of great importance, and in addition to their tower inspections most of our members have been engaged in lecturing to various bodies. In Devon another successful Belfry Maintenance Course was held in 1973, with visits to three towers each with different types of frame and gear, and classroom instruction in bellhanging theory and rope-splicing. John G. M. Scott, Chairman. F. Sharpe, F.S.A., F.I.O.B., F.F.B., M.R.S.H. B. D. Threlfall, M.A., M.I.C.E., F.F.B. The Revd. Scott proposed the adoption of the report, pointing out that in the copy sent to members Ambridge had appeared as being in Dorsetshire, rather than Barsetshire, and that the committee’s new handbook was in fact called the “Towers and Bells Handbook” rather than the “Towers and Belfries Handbook”. In connection with this book, he wished to pay credit to the member who had been responsible for the major job of editing the book. Although his name did not appear as editor on the title page since the committee had agreed that their names should simply be listed in alphabetical order, it had in fact been Mr. A. J. Frost. Mr. B. D. Threlfall (Cambridge Univ. G.) seconded. Mr. D. P. Smith (Kent C. A.) enquired whether it was the committee’s policy to inform the local society of any proposed inspection in its area. The Revd. Scott said that this question had not come up before. The committee worked for the benefit of the Church in general, and if it received a request for an inspection from someone in authority in the parish, such as the incumbent, it would make one. It would ensure that the incumbent knew of the visit, but it had not been its custom to notify the local association: to do so would entail considerable extra work and cost. Mr. Sharpe confirmed the importance of ensuring that the incumbent knew and approved of any proposed inspection. Mr. P. A. Corby (Kent C. A.) said that the question had been raised before and asked the committee to reconsider its policy, so that the local association was notified if at all possible. There was a danger that the association, which was often asked to raise money for its Bell Restoration Fund, could feel slighted if an outside body came to make an inspection without telling it. The Revd. Scott said that he would certainly bring the matter before his committee, but that the matter was not quite so straightforward as it might seem. In Kent, where the county association did most of the work itself, there was little problem, but elsewhere - such as in Devon or London - it was not immediately apparent to which society a tower might be affiliated and it would be difficult to find out. Mr. W. F. Moreton complimented the committee on having produced a really excellent handbook: he thought the photographs of churches in Herefordshire particularly valuable (laughter). Once again we have encountered a difficult year, but are now able to report a far brighter situation than has often seemed possible. It will be recalled that in last year’s report (RW 6/7/73, supplement) we were able to report our Editor’s return to office after his illness earlier in the year. With the exercise of much restraint on his part and the care of Mrs. Denyer and the help of others, he has continued in health and able to cope with his job so well that, in spite of everything, our average weekly circulation during February, 1974, is well over 100 more than that for February, 1973, and is indeed within the sight of the 6,000 a week we had hoped for. And if we accept the view of many of our correspondents, the quality of recent productions is higher than ever. During the year we have continued to keep the Exercise informed of our meetings and decisions and this report can therefore be the briefer. It will be recalled that at our November meeting (RW 7/12/73, p.975) we reported that during 1973 costs had risen at the rate of about £2,000 a year and that, for 1974, we faced further additional costs of about £4,000 a year. We had therefore decided reluctantly that we could no longer hold the price, as we had for three years, and it was increased to 10p a copy. We had also for the remainder of the year to reduce the number of extra page issues until the price rise took effect. In the result we issued exactly as many pages as in 1972. We are therefore the more pleased at the circulation figures quoted above, which show that many of our readers clearly accept the justice and necessity of the increase, so that a feared loss of circulation has not occurred. A further indication of the good will of our readers is that although the net loss for the first nine months of 1973 was about £225, the final accounts for the year, now presented to the Council, show a credit balance of about £100. Donations from readers at over £1,600 are up some £240, but nearly £600 of the total was received during the last three months of 1973. We are still concerned about the size of our reserves in relation to our annual income and expenditure. Whereas some years back the reserves were equal to one year’s turnover, the figures now are - assets nearly £11,000; annual turnover £23,500. Due to continuing inflation, next year’s turnover will of course be even higher. Meanwhile our investment position continues to be the subject of close professional scrutiny. We must pay tribute to the management and staff of Seven Corners Press Ltd., for their courtesy and help in difficult negotiations during the year and for the facilities which we have much appreciated during our first year of occupation of the new office. Also for their very close cooperation with our Editor during these recent weeks, when neither we nor they have known whether they would be on 3-day or 5-day working or whether indeed The Ringing World would come out on time, or at all. We are glad to say that, to date, we have managed, though at times distribution has suffered through postal or rail difficulties. Even the rail accident at Ealing, being on a Wednesday afternoon meant the loss or hold up of copies of our paper. Our thanks are due to Mr. and Mrs. Lucas for their continued labours in the Guildford office; to all our contributors; to our anonymous friend who supplies the index; to Mr. Douglas Hughes, our treasurer, and Mr. David Tate, our accountant and auditor, both of whom do far more for us than we could reasonably expect from their positions. The Chairman acknowledges with gratitude the help and support be has received from other members of the Committee and the Officers of the Council. Mr. W. G. Wilson (Life Member) proposed the adoption of the report. He quoted from an article in The Stamp Collectors Magazine deploring rising costs due to higher fuel bills, inflation, and so on, to show that - since the article in question had appeared in December, 1873 - the committee was not facing a new situation. However, he felt that the paper was now better than ever before, and in fact could be considered the committee’s real report. He congratulated the Editor on that, and particularly on that week’s issue, which contained something for everyone. But the committee was not complacent, and welcomed any constructive criticism. He was pleased and relieved to see that the recent increase in price to 10p had not affected the paper’s circulation and pointed out that, whereas some recently published books cost up to £1.60 for 80 pages, readers of The Ringing World had last year received 1,048 pages for £3; this year, the cost was £5 or £6. Increased postal charges were due to come into effect on June 24th. With 3,000 postal subscribers this would entail an additional expenditure of £750 per year. As a result, when the committee met the previous evening, it had decided that postal subscriptions renewed from July 1st would cost an extra 25p. This would not affect most subscribers until next January, but it was necessary to be prudent. Circulation now stood at some 5,800-5,900 copies a week. If each member of the Council could get two more subscribers the 6,000 barrier would be passed, and it should be possible to have more 24-page issues. Mr. R. S. Anderson seconded, and expressed sincere thanks to Mr. Wilson and to the Editor, Mr. C. W. Denyer, for their work (hear, hear). Mr. I. H. Oram (Kent C. A.) enquired about the contents of the larger issues. In view of the number of quotations from the Church Times, was the Editor having difficulty in obtaining sufficient contributions from ringers, he asked. Replying, the Editor said that it was often difficult to fill the page with ringing gossip, since few ringers provided any; if it were sent, it would be included. But in the meantime he was selecting items from the Church Times that were likely to be of general interest to ringers. Mr. G. A. Halls wondered whether anything could be done to maintain the momentum of the correspondence columns. At one time he had found these most interesting, but more recently there had been long delays, of four weeks or more, between questions and answers appearing. To be lively such a column needed replies to be published promptly. Mr. Denyer said that publication was not deliberately delayed, but that because of printing schedules it was virtually impossible to print a letter within three weeks of its receipt. Mr. C. K. Lewis (honorary member) suggested that the initial letter be circulated privately first, and then the letter and its replies sent to The Ringing World for publication in successive issues. Mr. D. E. Sibson (Soc. of Royal Cumberland Youths) raised the question of the truth of peal compositions published in the journal, pointing out that these were not news items but technical information. For a period he had, with the editor’s co-operation, checked all compositions submitted, and as a result 11 false ones never appeared in print. Over the past year he has checked all compositions, of quarter-peal length and upwards, that had appeared and had found seven of the 133 to be false; he did not think this a very high standard of accuracy. At the same time he readily accepted that it was not the job of either the editor or the Ringing World committee to check compositions that were received. He would nevertheless propose that all compositions should be independently checked before publication. After Mr. Denyer had said that this was being done by Mr. David House, Mr. Sibson said that he thought it should be the responsibility of the Council to check, and that this could perhaps be done by the Peal Composition Committee. Mr. N. J. Diserens (Oxford D. G.) seconded Mr. Sibson’s proposition, and asked whether it might be possible to have the compositions printed together, rather than used as fillers, so that they could the more easily be extracted and kept. Mr. Denyer said that compositions presented particular problems for the compositors, while poor “copy” often entailed extensive and time-consuming recopying; it was better it compositions could be collated and neatly typed so that they could be made straight into printing blocks. Mr. Diserens remarked that, if the compositions were to be checked by computer, there would be little difficulty in obtaining such a version straight from the machine. Mr. Sibson’s proposal was agreed by the meeting. Mr J. Hartless (Winchester and Portsmouth D. A.) asked what the balance was between postal and non-postal subscribers, and which the committee preferred. Replying, Mr. Wilson said that the balance was roughly even, and although there was a slight financial benefit from postal subscribers, it was not enough to make any significant difference. There was however a slight worry that, should the number of postal subscribers drop beyond a certain level, it could make the employment of a packer uneconomical. Mr. P. M. J. Gray (Australia and New Zealand A.) said that he had a mild reproof for the committee. He accepted that if The Ringing World were not a successful business, there would be no journal, and it was therefore right that the committee report should consider the business side. But the committee should also consider aspects other than the purely business ones, and he would like to be reassured in this annual report that the committee was also considering the journal as a newspaper, a provider of news. Mr. Wilson repeated that the weekly issue of The Ringing World was the committee’s main report, and this gave what Mr. Gray was seeking. Of course the committee considered the paper’s contents, but it could not print what it did not receive. Anything that was relevant, reasonable and respectable would be printed, he said. Mr. D. A. Bayles (Durham and Newcastle D. A.) said that it would be useful to have a list of the towers that had appeared on the front pages. A list of those that had appeared during 1973 had been compiled, and lists for earlier years were being drawn up. After some discussion instigated by Mr. G. W. Randall (Coventry D. G.) about the merits or otherwise of continuing to include cartoons in the paper, the report was adopted. There followed some discussion as to where compositions should be sent for checking, as was now required after the acceptance of Mr. Sibson’s proposition, Mr. Denyer pointing out that to send them anywhere via The Ringing World could cause only delay, extra work and extra postage. It was finally agreed that they should be sent to Mr. W. E. Critchley, as chairman of the Peal Compositions Committee, who had expressed his readiness to help; he would, he said also appreciate any computer assistance that could be provided. Mr. J. R. Taylor (chairman of the Computer Co-ordination Committee) confirmed that his committee would help in any way it could, for example by providing the names and addresses of those who had computer peal-checking facilities. Turning to The Ringing World accounts, Mr. Wilson said that the profit of £100 on an annual turnover of £23,000 was negligible - although admittedly better than a £100 loss. He hoped that there would be a further slight increase in the journal’s funds before rising costs again caught up with them. Of the £12,500 invested, £2,500 was realisable at par, and the remainder (which had cost £10,014) was at 31st December 1973 worth £11,840. He paid tribute to the paper’s accountant, Mr. D. A. Tate, who, although a non-ringer, came to all committee meetings, gave excellent and expert advice, and did all the work on investments for a very small charge. There being no questions, Mr. C. A. Wratten then proposed, and Mr. F. E. Dukes seconded, the option of the Council’s accounts. This was agreed. Dr. J. C. Baldwin said that a number of ringers would like access to a complete set of Ringing Worlds from 1911, but it was becoming increasingly difficult to acquire back issues. He therefore wondered what interest there would be in obtaining a microfiche copy of the complete set. He had made a very preliminary costing, which suggested that, with some 49,000 pages to be copied, 50 sets would cost about £65 each, or 100 sets about £50 each. When it was realised that to buy and bind a current year’s issues cost some £9, 63 years’ issues for £50 provided clear value for money. And although a viewer would cost at least a further £90, a growing number of local libraries were acquiring viewers. On a show of hands, about ten members indicated that they might be interested in such a scheme, and Dr. Baldwin said he would write a letter on the subject for publication in The Ringing World. Mr. Wilson said that either the set in The Ringing World office or his own set would be made available for copying if required. We have audited the annexed balance sheet dated 31st December 1973 and have obtained all the information and explanations we required. In our opinion, the balance sheet is properly drawn up so as to exhibit a true and correct view of the state of the affairs of “The Ringing World” according to the best of our information and the explanations given to us, and as shown by the books. The aim of the Committee during this its first year of existence has been to press forward with the work required to fulfil the terms of reference agreed at Oxford. Although much work has been devoted to these activities, progress has been rather slower than we, perhaps optimistically, hoped, though there is nevertheless considerable development to report. The first essential has been to establish on a formal basis the contacts already made with the national bodies concerned with redundant churches. We are pleased to report that relations with all these authorities have been established on a most friendly and co-operative basis; and we have met a strong desire on their part to have a central organisation such as the Council to which they can turn for advice both specialist and representative concerning bells. The Church Commissioners’ role in the preparation of redundancy schemes and often in the disposal of fittings was described in our paper last year. We have received considerable assistance from their Redundant Churches Dept., and we are assured that they also appreciate the considerable proportion of our time and effort which has been devoted to the problems on which they have sought our advice. As a consequence of this and of the increasing load on the Department, the Commissioners have decided they would wish to refer all questions of bells and their fittings, from whatever source, to this Committee in the first instance for advice. This does not mean, for example, that there will no longer be direct contact between affiliated societies and the Church Commissioners regarding redundant bells, but rather that this Committee will be involved, at a very early stage, in its co-ordinating role. The Council for Places of Worship, who it will be recalled are consulted at the earliest stage of redundancy proceedings, have very kindly undertaken to supply us with a list of churches on which they have given preliminary advice. This list must inevitably be confidential, but discussion continues as to the stage at which the information can be disclosed. The Council for Places of Worship feel that the peek of redundancies has already been passed from their point of view, in terms of numbers. It should however be remembered that their advice pre dates redundancy declarations by perhaps two or three years, and also that the early churches declared redundant were often churches which had been closed for some time, chapels of ease, etc., and relatively bell-less, so that this does not mean that for us the problem is past its peak. We have also at various times during the year been in contact with the ringing members of the Bells Sub-Committee of the Council’s Conservation Committee, Mr. Sharpe (who of course is a member of this Committee), Mr. Clouston and Mr. Elphick. We plan to continue these contact to ensure that the Sub-Committee is fully aware of our activities and similarly that we should be able to use fully their very wide experience. The Redundant Churches Fund, which takes over particularly important churches for which no suitable alternative can be found, have been helpful in providing us with information. They have also indicated that they would probably be willing to consider financial help with the preservation of especially important bells, should the need arise. They are already responsible for making sure that the bells, like the other fittings, of churches vested in them are maintained in good condition. The Committee has offered any help it ran give to the other statutory body, the Advisory Board for redundant Churches; but in fact, as they point out, the Advisory Board is much less practically concerned with fittings that the other national organisations. At Oxford the complications and anomalies of the Pastoral Measure were mentioned. The General Synod has set up a Working Party to consider and advise on revision which might be desirable to the Measure. This Committee gave written evidence to the Working Party on the anomalous working of the Measure as far as bells and fittings were concerned, and suggested for consideration (i) centralisation of fittings, preferably with the involvement of the Church Commissioners, i.e. extension of the deputy principle; and (ii) dispersal of fittings during redundancy consideration and proceedings should only be with the approval of the Church Commissioners, i.e. the faculty procedure would be suspended. In making these recommendations to the Working Party the Committee had the general agreement of the Church Commissioners, the Redundant Churches Fund, and the Council for Places of Worship. We understand that the Church Commissioners have in fact made similar recommendations for church fittings. The Report of the Working Party has not yet been published. During the year the Committee has been consulted on twenty-seven churches, involving a total of some seventy-four bells. These have generally been cases where the Church Commissioners have become involved. The Committee has been fully involved in one particularly difficult case where its advice and assistance were sought to prevent an ill thought out scheme from proceeding. On another occasion the Committee was invited to attend a meeting between an Association and its Diocesan Advisory Committee. Demonstrating the resources of experience and advice with which the Central Council is able to support the affiliated societies has, we understand, gone a long way towards helping the Association restore its good relationship with the Diocesan Advisory Committee. Advice and information has been sought, too, from the Committee on the setting up of Bell Restoration Funds. Although some Associations have been exemplary in keeping the Committee informed of developments in their area, from others we have heard little or nothing; at least two major dioceses have provided no information at all to date on their local situation. In other parts it has proved extremely difficult to get any action from Associations concerned, and a disproportionate amount of effort is spent in these cases. A suggestion made at Oxford which both we and the Towers and Belfries Committee feel would be extremely valuable would be a complete inventory of bells throughout the country. We are aware of a number of diocesan associations who already have this under way, and we would like to commend it to all Associations. We have available a sample card to record the salient details, which could be made available at modest cost. Such an inventory would give an immediate answer to questions regarding bells in churches becoming redundant, and would also provide a wealth of information on conditions of bells, etc., for other purposes. The survey carried out early last year of the redundancy situation provided such sparse detail of the key areas that its publication value was extremely limited. We are now working on a survey including the latest data from the authorities mentioned earlier, and we hope to publish this during the summer. We are working too, on the details of a fund to enable redundant bells to be purchased to save them from being scrapped, and hope to have firm proposals on this by the autumn. In conclusion we would say there is much to be done. At Oxford we had records of 279 churches possibly affected by redundancy proceedings. This number had risen to 546 by March, and well over a thousand bells are involved, it is going to be a major problem in view of the rapidly escalating costs to avoid the loss of many valuable bells for scrap. Many of them may go abroad, as have a number during this year. From our viewpoint it is essential that we develop good local organisation, with good contacts, and that we establish as far as we can a comprehensive central list of bell requirements, so that availability can be matched to need. The Committee would like to express its sincere appreciation of the generous gift by the author, Mr. Frederick Sharpe, of “The Church Bells of Berkshire” and the four parts of “The Church Bells of Herefordshire” which have been invaluable in compiling information concerning these two areas. Mr. D. Beresford (Soc. of Royal Cumberland Youths) moved the adoption of the report. It was, he said, a report on the committee’s first year of operations, and covered a period when things were moving very quickly. The report referred to relations with the Church Commissioners. These were very happy, and were aided by the presence of one of the committee, Canon Felstead, on the Board of Governors. There were two points to note: the need to work out a policy with the Church Commissioners, and the fact that the committee was not trying to monopolise work on redundant bells but to involve all ringing societies in this work. As an example of the sort of thing that had already been achieved, Mr. Beresford referred to a chime of eight bells that were about to go for scrap. The Commissioners had informed his committee of this plan, the committee had consulted the local society at once, and as a result the chime was saved from the scrapyard. On the question of policy, he continued, there was considerable demand for single bells, and as a result the committee had agreed to recommend that no sound redundant bell should be recast if an immediate home can be found for it, even if this were some distance away; nor could the committee recommend the disposal of sound redundant bells as scrap metal to swell funds - this would be no more appropriate than to dispose of pews or stonework for profit. If however no immediate home appeared for an historically unimportant bell it might be possible to recommend that the metal be used in the casting of new bells, with a record kept of its provenance. On the other hand, cracked and unhistoric bells might more usually be disposed of as scrap, although welding might first be considered. The Commissioners have requests for single bells to be sent overseas to mission churches, and to this the committee could not object; but it felt that bells of historical importance should as far as possible be retained in this country. Frames and fittings, if re-usable, should if possible stay with their bells or, if this were impossible, attempts should be made to store them for future use. Continuing, he said that it would seem invidious for ringers or societies to be put in the position of deciding whether a parish could afford to dispose of its bells at less than their market value. The committee felt that it should try to make sure that those involved in the dispersal were aware of the values concerned so that no misunderstanding could arise. The Committee’s survey had now been completed, and a copy would be sent to all societies. It was considered imperative that all societies should maintain close contact with their diocesan authorities, and the committee was also very anxious that a complete inventory of bells should be built up: proforma cards were available for completion for this purpose. The committee recommended the setting-up of association working parties who would be able to act speedily in, for example, a demolition case, and would include people with experience of do-it-yourself bell work. It was trying to establish a central registry of needs, so that needs - whether for augmentations, single bells, to replace cracked bells, or something else - could be matched with known redundancies. Finally, Mr. Beresford asked that all information that comes to light about bells likely to become redundant should be passed to the committee; there was otherwise the risk that the committee would not hear of something until it was too late. For the future, the committee was considering the possibility of a bridging fund to enable it to acquire redundant bells, and also the possibility of a bell museum. The latter was possibly not within the committee’s remit, but would be referred to the Administrative Committee. In seconding, Mr. A. J. Frost (Univ. of London Soc.) emphasised that the committee saw itself as a clearing house between the Church Commissioners and the associations. Mr. D. P. Smith said that the committee had been set up far too late. The problem had existed for many years and the Kent County Association had already set up its own links. Now it found that the Council’s committee was overlapping with its own work. He saw the committee’s role as an advisory one, to assist local societies rather than to give advice to the Church Commissioners. The K.C.A., he said, feared that the introduction of an intermediary between local societies and the central authorities would inevitably bring delays and adversely affect local discussions, and also felt that the idea of moving bells outside the county was entirely unsatisfactory. Finally, he felt that an explanation of the workings of the Pastoral Measure should be sent to associations by the committee, as so far only very scant information had been produced. Mr. C. W. Pipe (Suffolk Guild) enquired whether the committee, or indeed any body, was in a position to act at short notice to save a ring of bells if it were about to be disposed of for scrap. Mr. Beresford replied that he had a private guarantor if necessary to advance the money. The Revd. J. G. M. Scott said that the situation in Kent, while reflecting great credit on the Kent County Association, was very unusual in the country as a whole, and certainly could not obtain in Devon, where there were two associations. The Committee for Redundant Bells could speak with far more weight and authority than could most local associations, but there was a great deal of tact needed in relations between local associations and the committee. Dr. J. M. Weddell (London C. A.) and Mr. F. T. Blagrove (Middlesex C. A.) both supported the Revd. Scott. In reply to a question from Mr. G. Dodds (Hertford C. A. ), Mr. Beresford said that the scrap metal value of bell-metal three weeks previously had been £55 per cwt. He accepted Mr. Smith’s statement that the committee was late in the field, but said that his remarks about the Kent County Association had not been entirely accurate: the committee had in fact provided the Association with the names of those to contact. He assured the Council that no delay would be introduced by the presence of the committee, and stressed the importance of giving a national view to national authorities. 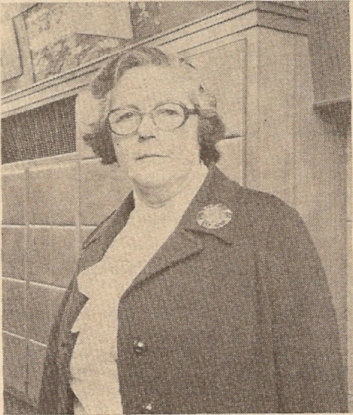 Mrs. O. L. Rogers (London C. A.) congratulated Mr. Beresford and his committee on their hard work during the year (applause), and the report was then accepted. After lunch, the President re-opened proceedings by welcoming two new honorary members of the Council, Miss M. J. Foster and Mr. R. H. Dove, who had inadvertently been overlooked earlier. The Council then resumed its consideration of the committee reports. A. First peals on tower bells in 1973. B. First peals on handbells in 1973. C. Record lengths on tower bells in 1973. D. Record length on handbells in 1973. The report was accepted without comment, on the proposition of Mr. F. T. Blagrove, seconded by Mr. D. E. Sibson. In our last report we referred to the extension of local broadcasting services and to their possibilities for creating interest in ringing. The information which we have received from our correspondents suggests that good use is now being made of these facilities to this end. Your committee has a small network of regional correspondents whose members report on ringing activities which have been publicised in the press and by radio and television. This gives a general indication of the attitude of the public to ringing. Ultimately, however, the maintenance of a healthy exercise depends upon the recruitment and training of local bands. We wish, therefore, in emphasise the part which every ringer has to play in public relations. We are obviously before the public whenever we ring, and we are usually taken for granted. On the other hand the absence of ringing on some special occasion may be the subject of public comment. The reason for the silent bells may be the lack of a band, or the poor condition of the bells, or even an unringable parson. Whatever the cause such comment presents an opportunity for capitalising on the interest which has been stimulated. Furthermore we ringers are very sociable people. We include among our numbers people from all walks of life and have probably one of the widest age ranges of any communal activity. There is, consequently, a considerable amount of material available which is very attractive to journalists, as some of us know to our cost. Nevertheless some organisation is needed if the best use is to be made of this wealth of information. It would be possible for each tower or guild or branch or association to appoint a publicity representative, but more impact might be made if the management structure of our organisations could be arranged to be as outgoing as possible. SERVICE RINGING - maintenance of links with the clergy at unmanned towers, ringing circuits, ringing for special festivals. EDUCATION AND TRAINING - Teaching methods, training of instructors and associated activities. UPKEEP OF BELLS - Bell maintenance, “do-it-yourself” activities, Guild assistance. REDUNDANT BELLS - Contort with the Diocesan Advisory Service, compilation of details of redundant bells. FINANCE - the preparation of budgets, advice on tax benefits for charities, investment advice. INFORMATION - provision of newsletters, liaison with the press, television and broadcasting, Ringing World liaison, contact with Diocesan public relations staff. The convenors have been appointed but they will co-opt as many members from the Guild as they feel are necessary to investigate their areas of interest and to prepare reports. Opportunity is thereby provided for many Guild members to participate in activities which could well influence the future of ringing in the Diocese. It may well be that the basis is being laid for the future administration of the Guild. Whether or not this happens the contacts with the Church authorities and other organisations outside the ringing exercise which will necessarily be made will offer openings for showing that ringing is very much alive in the modern world. The Royal Wedding last year and the attendant publicity stimulated interest in ringing. The television coverage of the ringing at Westminster Abbey was very well done. This attracted the attention of a number of freelance writers and journalists who sought the assistance of members of this committee in the preparation of magazine and newspaper feature articles. The reporting of ringing by the press and its inclusion in radio and television programmes which have been brought to our notice are summarized in the supplement in this report. Good relations continue to be maintained with the broadcasting authorities and we have again been asked to participate in the preparation of the Christmas Bells programme. We shall continue in seek the advice of Guilds and Associations on the towers which should be included in the programme. The final result will, therefore, be influenced very much by ringers’ own wishes. We are not reporting specifically on the overseas ringing scene. The considerable increase in recent years of overseas travel by individual ringers, overseas ringing tours, the formation of ringing societies outside the United Kingdom and reporting in The Ringing World have produced a self-generating situation. Our conclusion is that overseas ringing activities are now an integral part of the exercise. During the year extensive coverage was given to ringing on radio and television and in the press. In this supplement are reported the items of which we have knowledge through our correspondents. The bells of St. Margaret’s Westminster and of Westminster Abbey were heard on radio on the occasion of the Royal Wedding. Shots of the Abbey ringers in action and of the Abbey bells were shown on television. Radio interviewed one of the Abbey ringers for “Women’s Hour” and “The World Tonight” programmes. The efforts being made to restore the bells at Wooburn, Bucks, were featured in the Maidenhead Advertiser. A picture of the bell chamber and the tower captain, Colin Benton, was included. Our Past President, Fred Sharpe, has shown what can be done through personal contact with local radio. The following is an impressive list of his activities in 1973. From Radio Oxford, four handbell recitals, a series of 32 talks on churches and their bells in the Diocese of Oxford and a talk on the activities of the Central Council. A talk on the White family, bellhangers of Appleton. In November a topical talk on the bells of Westminster Abbey and Great Somerford, Wilts. On ten occasions the morning programmes in December included carols by the Launton Handbell Ringers. On Christmas Eve a 25 minute programme entitled “The Bells are Ringing” arranged and announced by Fred Sharpe himself. This latter programme included readings from Ellacombe, Tennyson and St. Luke, with appropriate carols by the Iffley Handbell Ringers, The Launton Handbell Ringers and the handbell ringers of the Lady Spencer-Churchill College. On Saturday mornings throughout the year the Wedding Congratulations programme included bells in the background, chiefly those of Kidlington. BBC Television made a film at “Derwen” which included descriptions of his unique collection of bells and tuning forks, bellfounders’ marks and bell photographs. Also included were brief details of some of the considerable number of towers and their contents which he has surveyed and shots of ringing in Launton Church. Mention should not be omitted of the fact that in the series of 32 talks on the churches and bells of Oxfordshire the bells of most of the churches were recorded and broadcast. This enabled a great number of local ringers to be associated with the programmes. The annual rally of the Handbell Ringers of Great Britain was held in Birmingham Town Hall in May and was well covered by the BBC. The Thurlaston Bell Orchestra appeared on the TV programme “Pebblemill at One” on the day before the handbell ringers rally and was broadcast several times on Birmingham Radio. The year commenced with Oare Church (of Lorna Doone fame), from which the bells were being chimed to help the church restoration appeal. The bells of Widdecombe-in-the-Moor were given excellent coverage in association with a series of programmes entitled “Walking through the English Countryside”. Several programmes featured bells ringing for the Royal Wedding. A programme of life in the village of Great Somerford was seen on TV and the village bells, as well as those of Westminster Abbey, could be heard. Schoolchildren of Patchway C of S Junior School, Bristol, demonstrated handbell ringing by lapping part of a course of Plain Bob Royal. This was their tribute to Princess Anne and her husband. The “Expo” bells from Whitechapel Foundry were on show at the Fifth Great Working of the Steam Engine Show at Blandford Forum, Dorset. Despite indifferent weather the bells were in much demand and great interest was shown by the general public. Harlech TV introduced bells into their programmes on a number of occasions. In Newstime from the Bath and West Show, Mr. Arscott of the Wilton, Taunton, handbell ringers’ team, was interviewed and his team rang tunes and changes. Crown Paint advertisements used six-bell ringing as a background. During “The Fenn Street Gang” programme a wedding episode was shown; rounds and queens were heard on one ring of bells and changes of Major on another. During the showing of a wedding scene in the “James Hadleigh” series a light ring of six bells was heard ringing doubles supposedly from a Norman tower in Yorkshire. During the junior programme “Magpie” ringers were seen ringing three bells - shots of the bells and ringers below - quite a valuable and interesting bit of publicity. During television reporting of the Bristol 600 celebrations in August civic dignitaries were shown in procession from the Council House to the Cathedral. During this time the Cathedral bells could be heard ringing and then Major. The next day, whilst the Queen and the Duke of Edinburgh were visiting the Council House there were shots of a crowd of some 20,000 outside with the twelve bells of St. Mary Redcliffe ringing in the background. In the same month, during the “Monarchy 1000” celebrations, there were pictures of the arrival of the Queen at Bath Abbey with the bells ringing rounds on the ten bells for the whole of the time. Again whilst the Royal Party walked about in the City and chatted with spectators the bells were still featured in the background. On Westward Television, again in connection with the “Bristol 600” celebrations, there were pictures of many Bristol churches including the Cathedral, St. Stephen’s, St. Mary Redcliffe, and St. John-on-the-Wall. During this the bells of Redcliffe were heard in rounds on the twelve. Early in the year the BBC filmed the bells at East Bergholt in their cage prior to their being removed for restoration. A few months later they filmed them again when the restoration had been carried out. In March the BBC filmed the removal of the bells of the Norman Tower at Bury St. Edmunds prior to their going to Loughborough foundry; George Pipe appeared in this. The documentary took the form of an appeal and later an item about these bells appeared in a VHF news bulletin. In September George Symonds was interviewed on radio after his feat of ringing a peal at the age of 98. The same station also broadcast an appeal for ringers to man the bells at Sutton and at Holbrook where there are rings of six. Anglia TV in July gave a thirty-minute documentary on the Olde Tyme Rallye at Long Melford where, for the second time, the Suffolk Guild demonstrated ringing from the Expo Belfry and gave handbell items. The BBC is making a television film of “The Nine Tailors” by Dorothy L. Sayers. Norfolk churches have featured in this including Terrington St. Clement. The ringing which is central to the plot of this story was done by qualified ringers but in the film it will appear that it is being done by the actors. Recorded ringing was produced by a band of ringers from the area. The Irish Association celebrated its 75th birthday with a Ringing Festival held in Dublin in October. A special effort was made with the broadcasting authorities and the press to publicise the event. The resulting coverage, however, was not as great as had been hoped but taking the year as a whole ringing received greater than average publicity. The BBC included the bells of Holy Trinity, Drumbo, during June for the 7.45 a.m. Sunday broadcast on Radio 4. St. Columb’s Cathedral, Londonderry, were included in the Christmas bells broadcast and the bells and ringers of St. Malachi’s, Hillsborough, were seen and heard on Easter Sunday. Radio Eireann broadcasting service ringing from St. George’s, Dublin, St. Canice’s Cathedral, Kilkenny (on TV), St. Finbarre’s Cathedral, Cork, and St. Patrick’s Cathedral, Dublin; the latter was before the inauguration ceremony in the Cathedral of the President of Ireland, Mr. Erskine H. Childers. St. Patrick’s bells were heard too after the annual carol service on Christmas Eve; the twelve bells were well struck and clearly heard. Jim McManus and Tim Kenny, the oldest and youngest ringers at St. John’s Lane, Dublin, were interviewed in connection with the centenary of the bells of SS Augustine and John. The bells of Shandon, Cork, were heard on a number of occasions, and Christ Church, Dublin, were added as usual to the festivities at the Cathedral on New Year’s Eve which is now an annual event relayed by Radio Eireann. A special “Bells” programme lasting 45 minutes was broadcast from Radio Eireann on 28th December. It included legends about the bells of St. Mary’s Cathedral, Limerick, the ringing of these bells, and an interview with George Bingham, the local secretary. An interesting discourse about the bells of Shandon, Cork, and Father Prout’s association with them was also included. Dr. Colin Lewis spoke about bells in general and the bells of both Christ Church, Bray, and Delgany Parish Church were clearly broadcast. The programme was most interesting and well produced. It was a pity, however, that one did not know about it until it was announced only five minutes before coming on the air. In the programme it appeared under the title “Network”, otherwise a larger audience might have had the opportunity to appreciate it. The Irish Times referred to the bells and the ringers when making its report of the centenary of the Church of SS Augustine and John, Dublin. The Liberties Festival brought reference to the bells of the old city and this too mentioned this church as well as the bells of the two cathedrals. A half-page, well written article, on bells, bell ringers, and the Irish Association’s Ringing Festival, together with a photograph of Fred Dukes, was included in the Evening Herald. The Cork Examiner’s reporter, Maureen Fox, discovered the appeal of change ringing for her column when she visited St. Finbarre’s Cathedral, Cork. She met the schoolgirl ringers from Ashton Boarding School as well as some of the local ringers. George Bingham was particularly featured in an article on bells in the Limerick Leader. The same paper published a full page article on the history of the Irish Association, its ringing festival, and rings of bells in Ireland. The tower of Mount St. Alphonsus dominated the article. “Belles on the Bells” was the title of a photograph accompanying an article in the Sunday Press about the boarder bellringers at Drogheda Grammar School. Mr. Robert Greer, sixty years a ringer at Drombo, was photographed in the Ulster Star whilst receiving a presentation to celebrate the event. Ballylesson bells, which were recorded for the “Christmas Bells” programme for 1972 were used by the BBC to introduce Sunday programmes for one month during 1973. We have received little information from Scotland. 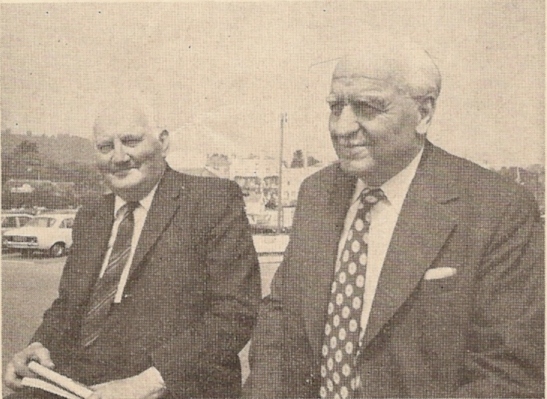 The Argyllshire Standard and the Oban Times, however, reported the activities of Mrs. Michael Noble, Norman Chaddock and the Friends of the Bells in connection with Inverary bells. 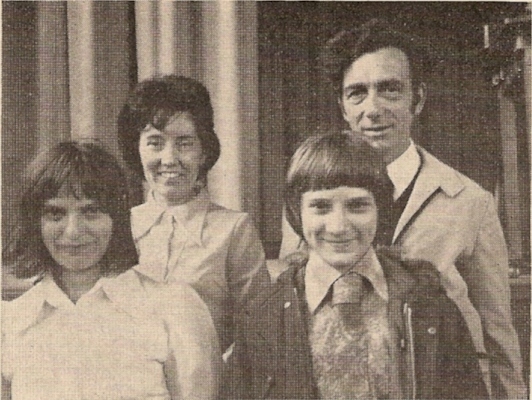 The former paper included a picture taken in the belfry of ringers about to start ringing. The Scunthorpe Evening Telegraph, in its “Round the Churches” column featured a visit to Scunthorpe by the Grantham ringers for a peal of Double Norwich during a peal week. A picture of the ringers was included as was one of the page in the Ringers’ Diary devoted to Double Norwich together with a note to the effect that it was not a football pools permutation. The Boston Standard published a photograph of W. B. Dawson of Bicker with two of his young ringers, Peter Allerton and Peter Keal together with a short ringing biographical article. The Master of the Peterborough Diocesan Guild enquired whether ringing from a tower in the Diocese could be included in the Christmas Bells programme to mark the opening of the Guild’s 50th anniversary year. Arrangements were made with the BBC for this to be done. The resulting ringing was a great credit to the Guild and to the ringers taking part. Moving the adoption of the report, Mr. J. S. Mason (Ancient Soc. of College Youths) expressed his thanks to all the correspondents who had enabled the supplement to be produced; Dean Thurlow (Life member) seconded. Mr. C. W. Pipe thanked the committee for its report, which he thought good and comprehensive. It did however have one glaring omission - there was no mention of the broadcast of bells at 7.45 a.m. each Sunday morning. Since last year, when he had asked for better recordings, they had seemed to get worse. Why were they used when there were such good recordings available, he asked. If the committee was responsible, could it not do better; and if it were not, could it not approach the BBC to get something done? (In reply to subsequent questions from various members, Mr. Pipe emphasised that it was the quality of recording, rather than the quality of ringing, of which he was complaining. Mr. H. N. Pitstow (honorary member) commented that he would think twice before telling a BBC engineer where to put his microphone (laughter). Mr. J. S. Mason said that all the recordings used came from past “Christmas Bells” broadcasts, and although he and Mr. Pitstow had 18 months ago been through the BBC’s recordings and selected the best, what was actually broadcast depended entirely upon the producer. Mr. H. N. Pitstow explained how the towers used for the Christmas broadcast were chosen in the first place. There were two main factors to be considered: a combination of one ring of 12, one 10, three 8’s and two 6’s had been agreed with the BBC, and the Corporation required these to be widely spread geographically. The BBC usually contacted him in August to say that there would be a broadcast and he would in turn get in touch with regional contacts to suggest suitable towers; as far as possible each region got its turn with 12-bell and 10-bell towers, etc. But the programme was not intended to be an exposition of change-ringing, but to be typical of Christmas ringing throughout the country, and the final choice always remained the BBC’s. Ringing used for the Sunday morning broadcast was chosen by the BBC from its own archives, although the Corporation had accepted some suggestions he had made to them about a year ago. The Revd. J. G. M. Scott said that he had at one time been under the impression that the BBC retained in its archives copies of all its recordings, but when he had enquired about recordings of Devon bells had discovered that this was not so. Mr. Pitstow confirmed this, saying that he had been told that only the two best recordings from “Christmas Bells” were retained each year, although he had some doubts whether this was in fact done. Mr. A. J. Frost commented that Christmas ringing was one thing, the Sunday morning broadcast another. Mr. W. T. Cook (Ancient Soc. of College Youths) said that Evercreech bells could be heard on Radio 2 at 6.50 a.m. on Sundays. Mr. J. S. Barnes drew attention to the omission from the supplement of any mention of a most enjoyable live broadcast by Mr. F. Sharpe and the Launton handbell ringers on “Nationwide” just before Christmas; he felt this deserved a mention, and congratulated Mr. Sharpe and his band on their performance. After Mr. Sharpe had said that he would speak to the committee about the placing of microphones, the report was adopted. Another year has flashed by and it has been another busy one. Sales continue at about the same level, with one exception, Change Ringing on Handbells. The sales of this book have almost doubled this last year, a very healthy sign. The Beginners Handbook continues to sell well. I regret the new Towers and Belfries book is not yet available; it was printed last November but problems have been found in getting it bound. Efforts are still being made to get it produced at the earliest possible date. One point which does sadden me is the fact that the Doubles book and “Surprise Methods - Place Notation” are not in print. I understood the material would be in my hands by now. Getting a book printed is a fairly quick job but this I cannot do until I have the details. I hope this can be rectified soon. I intend to leave any review of prices as long as possible, but with administration and postage costs continuing to rise we may be compelled to raise prices before long. To conclude on a more happy note, there appears to be an increase in ringing overseas, if our mail is anything in go by. We have also been very happy to receive a number of appreciative letters for the Publication service, especially from our overseas friends. * Only available part of the year. Adoption of the report was proposed by Mr. G. R. Drew (honorary member) and seconded by Mr. W. F. Moreton. Mr. C. J. Groome wondered what were the economics of the excellent “Towers and Bells Handbook” and what plans there were for publicising its existence; for example were there plans for reviews of the book to appear in the architectural press? On the fourth paragraph of the report, he thought it important to review prices, bearing in mind not only administrative and postal costs, but also the purchasing power of the committee’s capital. Several publications would soon need reprinting, and there seemed to be little in the Publications Fund to meet the necessary costs. On the whole, he thought that prices were too low. After Mr. Drew had said that the printing cost of the new book was, he thought, about 80p per copy, the Revd. J. G. M. Scott explained that this had been kept so low largely because a number of blocks had been loaned free of charge and because most of the layout work had been done by Mr. Sharpe. Because the book was intended primarily for professional people, it was being priced to be comparable with other technical publications they would buy; otherwise they might well feel it not worth considering. Review copies were being sent to the architectural press, and advertisements for the book were to appear in the Church Times and the Architectural Journal. Mr. F. Reynolds (Lancashire A.) offered the Council material used in the Lancashire Handbook which the Association could no longer afford to have printed; and Mr. D. E. Sibson said that the Surprise Major methods collection could be produced annually in the form of a computer listing for about 25p per copy. Mr. Drew said that his committee would look into its prices and, in response to a question from Mr. J. S. Barnes, said that it was already looking into the reprinting of the book on handbell ringing and that other reprints were being considered. In the absence of specific instruction from the Council, the Committee has produced no new publications during the year. The Committee would welcome any suggestions of an unfilled gap in the present collections, keeping in mind possible demand and probable printing costs. The report was adopted without comment on the proposition of Mr. W. E. Critchley (Yorkshire A.). Mr. G. E. Feirn (Lincoln D. G.) seconded. 4,031 peals were rung in 1973, 3,562 on tower bells and 469 on handbells. The total is 307 less than in 1972 - 153 fewer tower bell peals and 154 fewer in hand. The reduction in handbell peals is of course proportionately much the greater and time alone will tell whether the great increase in and enthusiasm for peal ringing on handbells over the last decade is now beginning to slacken or whether 1973 represents a temporary setback. There is no cause for concern in the reduction in the number of tower bell peals, which is still 200 more than the 1971 figure and 400 more than in 1970; indeed one often gets the impression from the pages of the Ringing World that in some quarters there is more emphasis on quantity than quality. There were 568 first pealers, 65 less than in 1972, and 84 firsts as conductor, 19 less than in 1972. The Winchester and Portsmouth Diocesan Guild had most first pealers with 46, followed by the Kent County Association with 33. A breakdown of the peals rung by societies and on different numbers of bells, both tower and hand, is attached. For completeness both affiliated and non-affiliated societies are included. The following affiliated societies did not ring any peals in 1973. Cleveland and North Yorkshire Association, Devonshire Association, Ladies Guild, Railway Men’s Guild, S. Derbyshire and N. Yorkshire Association. It is notable that on tower bells the reduction in comparison with 1972 is almost entirely in Royal, Major and Minor while odd-bell methods and Maximus remain about the same, but on handbells the reduction is on all numbers. This is one more than the number of societies which rang 130 or more peals to 1972. Newcomers to the list are the Kent County Association (which had only 97 peals in 1972), the Sussex County Association and the Gloucester and Bristol Diocesan Association, while the Bath and Wells Diocesan Association and the Lancashire Association drop out. Numbers of peals rung its the more popular methods are set out below. Compared with 1972, the most notable features on tower bells are that Stedman Doubles has gone up from 6 to 22, the popularity of Kent Treble Bob continues to decline and London Royal has overtaken Yorkshire Royal and on both tower and handbell Bob Minor is down by 60. Gloucester and Bristol Diocesan Association - Little Bob Minor at Cheltenham on 2nd October - the method does not produce true and complete 720s. Lancashire Association - Plain Bob Minimus at Ormskirk on 18th March - peals of Minimus on handbells are not recognised by the Council. Southampton University Guild - Doubles in 250 methods at Southampton on 9th November - some of the methods do not conform to the rules for Doubles methods, having eight successive blows in on place. Winchester and Portsmouth Diocesan Guild - Christmas Eve Treble Bob Minor at Southampton on 24th December - the method is false in the plain course. St. David’s Diocesan Guild - Minimus at Llanarthney on 22nd December included Kent T. B. - not acceptable because peals of Minimus must consist of true and complete 24’s, each starting from rounds. Ancient Society of College Youths - London, Cripplegate - Cambridge S. Maximus by a band of past masters and Bristol S. Maximus - both silent and non-conducted. Chester Diocesan Guild - Bidston - Bob Minor - five first pealers. Derby Diocesan Association - Alfreton - Doubles in three methods - five first pealers. Durham and Newcastle Diocesan Association - Stranton - Stedman Triples - three first pealers and four firsts of Stedman. Gloucester and Bristol Diocesan Association - Bristol, St. Stephen - 10 Spliced S. Maximus with every lead different work for every bell. - Elmore - T.B. Minor in 34 methods - silent and non-conducted by the Taylor family. - Stratton, St. Margaret - 165 Spliced S. Major. - Swindon - 100 Spliced Caters. - Cheltenham - 18,000 Bob Minor on handbells (the longest peal of Minor in hand). Hertford County Association - St. Albans - Cambridge Minor, Major, Royal and Maximus in one day with the same ringers in the same positions on the back six bells in all peals. - Watford - 22 Spliced S. Royal on handbells (the most methods to a peal of Surprise Royal in hand). Kent County Association - Hawkhurst - Grandsire Triples - six first pealers (including the conductor). Lancashire Association - Accrington - 13,440 Lincolnshire S. Major (the record length in the method). Leicester Diocesan Guild - Loughborough Bell Foundry - 10,080 Bristol S. Major by the band which rang the 40,320 Bob Major in 1963. North American Guild - various handbell peals, including Yorkshire S. Royal and London S. Major (the first of both methods in hand in North America). Oxford Diocesan Guild - Warfield - 100 Spliced Caters. - Aston Tirrold - Grandsire Doubles - five first pealers. Peterborough Diocesan Guild - Easton Neston - 165 Spliced S. Major. Salisbury Diocesan Guild - Seend - Grandsire Doubles - five first pealers and first as conductor. Winchester and Portsmouth Diocesan Guild - East Tytherley - 13,440 Cambridge S. Major. - Eling - Grandsire Double s - five first pealers and first as conductor (ages 14-16). - Upper Clatford - Grandsire Doubles - five first pealers. Worcestershire and Districts Association - Stourbridge - 10,080 Bob Major by the local band. - Wakefield - 85 Spliced Plain Royal on handbells. Yorkshire Association - Scarborough - Doubles in 5 methods - five first pealers and first as conductor. In our reports for 1971 and 1972 we drew attention to the large number of errors in the peal columns of the Ringing World, on which our statistics are based. We are glad to say that in 1973 there was a significant reduction in the number of obvious errors (e.g. vital information missing). Nevertheless, we continue to ask conductors to notify the Editor immediately of any errors appearing in their peal reports. Proposing the adoption of the report, Mr. F. B. Lufkin (Essex A.) said that he had now realised that the Cleveland and North Yorkshire Association, shown as having rung no peals in 1973, had ceased to exist three years ago, and that the S. Derbyshire and N. Yorkshire Assoc., should read “S. Derbyshire and N. Leicestershire Assoc”. He had also just received a letter from the Southampton University Guild (which was not affiliated to the Council) appealing against the omission of the peal in 250 Doubles methods and suggested that it be referred to the Methods Committee. After Mr. C. H. Rogers (Middlesex C. A.) had seconded, Mr. F. T. Blagrove said that he had seen the letter mentioned by Mr. Lufkin, but although it argued that the 8 successive blows in one place sometimes occurred at a bob (and might thus be acceptable), it omitted to say that elsewhere 8 successive blows occurred on the lead. Mr. W. L. Exton (Southwell D. G.) pointed out that in Appendix b. to the report the Post Office Guild was one of Ringers, not Workers (laughter), and Mr. D. A. Bayles then enquired whether the Winchester and Portsmouth Diocesan Guild’s total included a performance at Hebburn on 26th April 1973, and, if it did, what standards had been applied by the committee. In reply, Mr. Lufkin said that the committee had received objections to the Hebburn peal by some members of the Durham and Newcastle Association, and had as a result made enquiries of the complainants, the band, and the association to whom the peal had been credited. Both the complainants and the Winchester and Portsmouth Association had co-operated fully, but he had been unable to obtain any reply from the conductor of the peal. The Administrative Committee had as a result been consulted, and had considered that the peal had to be accepted on trust. It had therefore been included in the analysis. Mr. J. Prytherch (St. David’s D. G.) asked whether the Council would reconsider its ruling on peals of Minimus. The band that had rung the peal at Llanarthney felt that 48’s of Minimus should be accepted as were 240’s of Doubles. Mr. Blagrove said that there were two points: the Council had agreed in the past that Minimus must be rung in true and complete 24’s, and methods rung in peals must be true in their plain course. He would, he said, have agreed with Mr. Prytherch if only the former had been contravened, for example by ringing Spliced, but Kent T. B. Minimus was not true in its plain course, and this was overriding. The peal could not be accepted. Mr. C. W. Pipe enquired whether the reference in the opening paragraph to “quantity rather than quality” alluded to some recent fast 12-bell peals, but Mr. Rogers said that it only reflected an impression that sometimes the desire to get a peal was greater than the desire to get a good peal. The report was adopted without further amendment. Little progress has been made during the year with the work in hand, but consultation has taken place with the Computer Co-ordination Committee with regard to the production of an up-to-date collection of Surprise Major Methods. The report was accepted on the proposition of Mr. C. K. Lewis, seconded by Mr. S. J. Ivin (honorary member). In reply to a question from Mr. C. J. Groome, Mr. Lewis said that the “work in hand” consisted of the Doubles collection mentioned in the Publications Committee report and had included the Surprise Major collection, which had now been taken over by the Computer Co-ordination Committee. The Committee has been involved in numerous ringing courses during 1973. It is difficult to separate committee work from local Guild/Association work, and it is right and proper that it is difficult. To list all courses “attended” by committee members would be tedious, but it is worth comparing the situation of ten years ago, when there were barely half-a-dozen held in the twelve months. The situation in the Oxford Diocesan Guild best illustrates the scope and importance of the course today. Three eight-week (one night each week) courses were held at different centres in conjunction with the W.E.A., their purpose being to present to the general public, and to ringers, the many facets of ringing; to try to clear up some of the public’s misconceptions, and in enable ringers in enjoy their hobby more fully. A weekend residential course was inaugurated at Easthampstead Park, being aimed at potential leaders. (This adult education centre has been booked for similar courses in 1974 and 1975). A dozen one-day courses at various levels, each catering for about 10 ringers all at the same stage, were held at convenient centres. The Hereford Course ran into its 11th year and tried in cater for some 70 different tastes. The mammoth task undertaken and executed by the local organiser, Mr. George Cousins, on top (as is usually the case) of the Guild secretary’s job, is noted with admiration. The Committee commends the scheme run by the Leicester Diocesan Guild whereby members can be given a grant towards the cost of attending courses. Apart from lectures which were an integral part of courses, Mr. F. Sharpe gave a great many broadcasts on radio and television, including two on the bells of Westminster Abbey and Great Somerford. A highlight of the year was the T.V. programme from Launton on Mr. Sharpe himself. Most of this work is obviously directed at the general public rather than at ringers - an aspect of Education Committee work not much considered in the past. The film has been out on loan six times in 1973. Two single sheet notices were printed for distribution to theological colleges; one gives information about the local Guild and the local tower, the other is titled “Duties of a Ringer” and is reproduced from Wilfred G. Wilson’s “Change Ringing”, published by Faber and Faber, by kind permission of the author and publishers. Three sets of notes were produced: “Conducting Grandsire Triples”, by Norman Chaddock, “Proof of Bob Major” and “Elementary Method Splicing”, both by Harold Chant are all available from Mr. and Mrs. G. Drew at a low cost. The Committee is grateful in the authors for their contributions, and to the following gentlemen for their offers to duplicate material: the Revd. 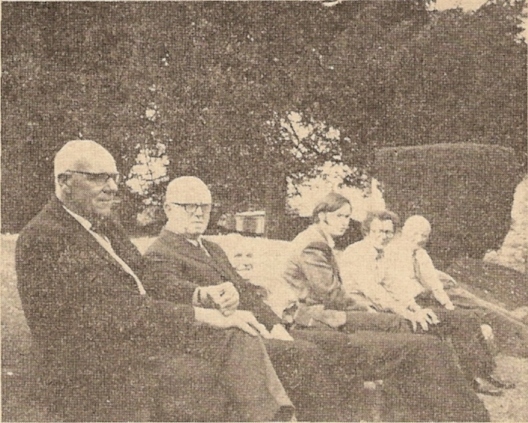 G. Stickland, Messrs. J. Atkinson, J. Fidler, C. A. Moxon and S. K. Thompson. Three of these offers have so far been taken up, and the considerable amount of work involved noted with sincere thanks. Titles for further duplicated notes will be welcomed by the Committee. A considerable number of coloured slides for the film strip on “Casting, tuning and hanging bells” has so far been taken, and it is hoped to advertise the sale of the strip (or set of slides) and notes later this year. Many of the pictures will be available for members to see on the Monday of the Council meeting at Exeter, so that an idea of the quality and scope can be made before ordering. This has now been completed. The Committee wishes to place on record its deep gratitude to Mr. W. Butler and in Dr. J. C. Baldwin for the huge task they have willingly carried out. It makes possible a more direct comparison with the earlier survey. It gives all Guilds/Associations the opportunity to have their own area surveyed, since each receives the local as well as the national survey. The use of a computer facilitates a larger survey. The real results of the first survey were not so much the figures produced as the schemes suggested to improve ringing standards, education, co-operation with the clergy and so on. The ringing course is, perhaps, the most obvious product. The fruits of the second survey are yet to be seen, but, as with the first survey, the spadework must, of necessity, be done locally. This Committee is now considering ways of following up the survey, and is, as always, open to constructive suggestions. One last point. If the Council ever requires another survey, it might consider asking the Computer Co-ordination Committee to undertake the task, rather than the Education Committee whose job is, specifically, education. Proposing the adoption of the report, Mr. W. F. Moreton said that it had always been his committee’s unofficial policy to enlist the willing help of non-members of the committee. Members would have noted the names of a number of such people in the report, but he wished to make special mention of Dr. J. C. Baldwin and Mr. W. Butler, who between them had done all the work on the Sunday Service Survey over the past two years. The first Survey was the cause of the committee’s existence, and he now looked forward to seeing the fruits of this second Survey during the coming years. Mr. Butler seconded. Mr. P. M. J. Gray said he wished to echo Mr. Moreton’s words on the Survey. He thought it was extraordinarily well done and congratulated them on the work and on its presentation. He had found it most interesting, and particularly the analysis of comments, which for the first time gave a picture of the ground-swell of feeling among ringers in general. It is often difficult to know whether the Council is doing what ringers want, he said, but now it had some idea of what was wanted. He hoped something would come from this report, as there had from the last, and that the committee would come up with further suggestions. In the meantime he thought it vital that everyone should read the report and that action should be taken on it by associations. The main work has been the compilation of a register of ringers who have been involved in computer matters of recent years. The information recorded consists of names, addresses, ’phone numbers, computers and languages used, achievements, dates and page numbers of Ringing World letters and articles, and a record of correspondence with the committee. There are at the time of reporting 62 names in the register. If members of the Council hear of experimenters, or meet them on their travels, they should encourage them to write to the committee, giving their details. In parallel with creating the register, the committee’s correspondence file has been assembled and cross-referenced in the register of names. The file runs from February 1968 to date, and at the time of reporting it comprises 110 letters. A third activity has been the compilation of a chronological index to all Ringing World articles and letters on computing from January 1964. In all there are to date 66 such items and their authors have been cross-referenced in the register of names. It is intended to publish this index in the Ringing World in due course. The committee wishes to draw attention to two technical papers which Mr. Robin Shipp has produced, both of which are concerned with the symbolic representation of rows. The first is an introduction to the subject which would benefit these wanting to study Maurice Hodgson’s Symbolic Treatment of False Course Heads. The second describes a FORTRAN implementation of a symbolic manipulation system and gives the complete test of the package. It is intended to make copies of these papers available at bare cost to experimenters who write to the committee. At its meeting in March the committee discussed at length the question of distribution of information. It was decided that the policy would be to use the Council’s official journal, The Ringing World, to report at half-yearly intervals on the work of the committee, and at the same time to make clear what specific technical and specialised literature could be obtained by writing to the committee. This literature would be provided at the bare cost of paper, duplicating services and postage. Whilst this committee is not responsible for checking the truth of peal compositions it does heartily recommend that such checks are made before new compositions appear on the printed page, and it intends to maintain up-to-date lists of persons offering computer checking services. In addition, test compositions can be supplied as a means of estimating the reliability of the checking programs themselves. The complete collection ordered numerically by place notation. The complete collection ordered alphabetically by method name. Mr. J. R. Taylor (Gloucester and Bristol D. A.) proposed the adoption of the report, saying that an approach had now been made to the Publications Committee about republishing the late Maurice Hodgson’s paper on false course heads. He asked that those with computer peal-checking facilities should contact the committee, and pointed out that a copy of the computer listing of Surprise Major methods so far rung, held by Mr. Sibson, was a good example of the sort of thing the committee could provide. Mr. C. K. Lewis wondered whether such a collection would be acceptable to ringers. Although he personally had nothing but admiration for it, he wondered what the reaction would be to having computer prints rather than a booklet, and how people would feel about buying a completely new - albeit updated - copy every year or so. Mr. N. J. Diserens could foresee no problem, and said that the listings could be held in a folder. Mr. C. Crossthwaite (Lancashire A.) asked whether the collection would be available through the Computer Committee or the Publications Committee. Dr. Baldwin said it would be handled by the Publications Committee, and should be available in about three months’ time. The original collection and appendixes A to J were already included, and the contents of the so-far unpublished Appendix K were nearly ready. The first issue would thus contain all Surprise Major methods rung to the end of 1973. The committee was still looking into the inclusion of Royal, Maximus and so on within the limitations imposed by computer printing. Bath and Wells Diocesan Association. 1946-72; Honorary, 1972-73. Died January 18th, 1973. Attended 21 meetings. Suffolk Guild, 1927-57. Died January 18th, 1973. Attended 9 meetings. Peterborough Diocesan Guild, 1945-51. Died March, 1973. Attended 5 meetings. Ladies’ Guild, 1938-51. Died May 30th, 1973. Attended 4 meetings. Guildford Diocesan Guild, 1936-57. Died October 2nd, 1973. Attended 9 meetings. Durham and Newcastle Diocesan Association, 1948-60. Died November 16th, 1973. Attended 6 meetings. H. J. Sanger learned to ring at Evercreech and was tower captain there for many years. He was a member of the Standing, Towers and Belfries, and Broadcasting and Television committees of this Council and was a Diocesan Adviser on the care of bells. C. J. Sedgley was well known as a composer and conductor of peals. He was a member of the famous Ipswich hand, and a Vice-President of the Suffolk Guild. Miss Steel was born in Yorkshire and became the first President of the Ladies’ Guild and was also a President of the Bedfordshire Association. She took part in the first “ladies only” peal. Miss Steel won the Yorkshire golf championship on five occasions and was an international golf player for seven years. She had taken “The Ringing World” since it was first started by Mr. Goldsmith. W. N. Park had been a ringer at Holy Trinity, Darlington, for 54 years, and during his 52 years’ membership of the Durham and Newcastle Diocesan Association was for some time Treasurer and President. For a period he acted as accountant of this Council. When he moved the adoption of the report, Mr. T. J. Lock (Middlesex C. A.) said that he had now discovered that Mr. G. S. Valentine had died on March 17th, 1973. Next year would probably see the arrival of the Council’s 1,000th member since its formation in 1891, since the total to date was 990. He asked that any outstanding biography sheets should be completed and returned. Mr. G. A. Dawson (Soc. of Sherwood Youths) seconded, and the report was adopted. The President expressed the appreciation of the Council to all the committees for their work and their reports, which contained, he said, much of real substance. After Mr. Sibson had queried the omission of any reference to the two committees set up last year from the copies of the Council’s Rules that had been circulated, the President explained that the Rules listed only the permanent committees of the Council; to include these extra committees would entail a change of rule. Mr. C. K. Lewis accordingly gave Notice of Motion to change Rule 12 next year, which the President accepted. The Secretary said that, although the Council had already agreed to hold the 1975 meeting in Lincoln, the precise date remained to be settled, the President and Mr. J. L. Millhouse (Lincoln D.G.) having undertaken to see whether a Monday meeting was possible. Mr. Millhouse said that the Lincoln Guild had made enquiries and had found that the hall in the College of Technology - which had very much better acoustics than the Chapter House, where the 1952 meeting had been held - was only available on the Tuesday (May 27th); it had ample car-parking space, and had therefore been booked. The headquarters hotel would be the Moor Hotel, Branston. Mr. G. A. Halls made a most eloquent invitation on behalf of the Derby Diocesan Association for the Council to come to Derby in 1977, which would be the 30th anniversary of the Association, the 50th year of Derby Cathedral, and the 300th anniversary of the ring of ten in its tower. The Borough Council had agreed to co-operate, and had offered the use of the Guildhall. Mr. K. Arthur (Durham and Newcastle D.A.) said that the 1870’s had been a vintage period for the foundation of ringing societies, including his own in 1877. The Durham and Newcastle would therefore like to invite the Council to its birth-place, Durham, in 1977, to mark its centenary. This might entail some changes in current practice, but if there were any difficulty in this, the Council would be most welcome at Newcastle-upon-Tyne. After some discussion, it was agreed to leave the decision as to which invitation to accept to next year, when the new Council could decide. Other centenary invitations were received from the Winchester and Portsmouth D.A. (for 1980), the Bedfordshire A. (for 1982) and the Sussex C.A. (for 1985); the Secretary pointed out that an invitation for 1982 had already been received from the Salisbury D.G. last year. Mr. C. F. Mew (Surrey A.) drew members’ attention to the change in county boundaries since April 1st; this meant that about 1400 towers, or a quarter of all those in the country, will be in new counties or in counties with changed titles. He thought it important that the new titles should be adopted for all official publications, including reports in The Ringing World. A number of speakers, including Messrs. W. G. Wilson, J. M. Jelley (Leicester D.G. ), W. E. Critchley and C. K. Lewis thought it best not to change, Mr. Jelley remarking that the first band to ring a peal at Oakham and publish it as being in Leicestershire would probably close the tower (laughter). Mr. Denyer said that he would have to rely upon his correspondents, for he hadn’t any staff to alter material that was submitted. It was agreed, after a suggestion from Mr. C. K. Lewis, that the Secretary should write to the relatives of the late Mr. G. E. Fearn, expressing the Council’s sympathy in their loss. Mr. J. S. Barnes felt that Sunday evenings’ open meeting on Bell Restoration Funds had dealt with a most important subject, and he wondered whether something should have been brought forward to this meeting. There was clearly a wealth of knowledge available on such things as dealings with the Charity Commissioners, and he suggested that a paper on the subject should be produced by knowledgeable ringers within the next 2-3 months and circulated; the Council should also appoint a person able to offer advice to associations wishing to set up a bell restoration fund. Mr. J. M. Tyler felt that such a paper would be of inestimable value; clearly a number of associations knew little of the implications of registering as a charity. In reply to a question from Dr. Baldwin, Mr. Denyer said a full report of the meeting was being provided by Mrs. Butler for publication in The Ringing World. The President said that the value of the meeting was that it gave people something to think about, and that the appointment of a person such as was suggested by Mr. Barnes was best left for the new Council; it could be a subject for discussion next year. Mr. P. A. Corby agreed, adding that he thought it best for a formal motion to be debated to avoid any discussion being inconclusive. The Secretary reported that of the 201 members possible, 164 were present, 46 associations were fully represented, 14 partially represented, and four not represented. Mr. R. S. Anderson proposed a vote of thanks to the President for his conduct of the meeting, which, he said, had been expeditious, smooth, and not without humour. He looked forward to having the benefit of his advice at the Council meeting for many years to come (applause). Mrs. O. D. Barnett thanked the Secretary and Mrs. Wratten for their work, and Miss D. E. Colgate (Ladies G.) for taking notes of the meeting for use by The Ringing World and the Secretary (applause). In conclusion, the President expressed the Council’s thanks to the Devon Guild for organising the weekend, mentioning in particular the committee which had consisted of Mr. Brian Pidgeon (President), Mr. Philip Jones (Secretary), the Revd. John Scott and Messrs. Frank Mack and Peter Sawyer; he also thanked the Dean and Chapter of Exeter and the various incumbents for the use of their bells over the weekend (applause). Life Members: W. Ayre, E. A. Barnett, J. Freeman, F. Sharpe, E. C. Shepherd, the Very Revd. A. G. G. Thurlow, W. G. Wilson. Honorary Members: Mrs. O. D. Barnett, F. E. Collins, C. W. Denyer, R. H. Dove, G. R. Drew, Miss J. Foster, D. Hughes, S. J. Ivin, C. K. Lewis, H. N. Pitstow, R. B. Smith, R. F. B. Speed, P. L. Taylor, Mrs. M. A. Wratten. Ancient Society of College Youths: W. T. Cook, J. S. Mason, R. B. Meadows, W. Williams. Australia and New Zealand Assn. : P. M. J. Gray. Bath and Wells Dioc. Assn. : G. W. Massey, E. Naylor, A. H. Reed, J. S. Walton. Bedfordshire Assn. : J. H. Edwards, K. H. Fleming. Beverley and District Soc. : I. G. Campbell. Cambridge University Guild: B. D. Threlfall. Coventry Dioc. Guild. : P. Border, G. W. Randall, H. M. Windsor. Cumberland and N. Westmorland Assn. : R. W. D. Wetenhall. Derby Dioc. Assn. : G. A. Halls, M. Phipps. Durham and Newcastle Dioc. Assn. : K. Arthur, D. A. Bayles. Durham University Soc. : C. C. Monson. E. Grinstead and District Guild: K. G. Game. Ely Dioc. Assn. : A. M. Barber, G. E. Bonham, J. G. Gipson. Essex Assn. : J. Armstrong, F. B. Lufkin, P. J. Rothera, D. Sloman. Gloucester and Bristol Dioc. Assn. : L. C. Edwards, A. R. Peake, J. R. Taylor, C. A. Wratten. Guildford Dioc. Guild: M. J. Church, T. Page, D. E. Parsons, P. G. Smart. Guild of Devonshire Ringers: Fr. P. Angold, J. M. Clarke, D. J. Roberts, Revd. J. G. M. Scott. Hereford Dioc. Guild: T. Cooper, P. Hughes, R. G. Powell. Hertford County Assn. : A. R. Agg, G. Dodds, G. Penney. Irish Assn. : F. E. Dukes, D. McEndoo. Kent County Assn. : P. A. Corby, S. Jenner, I. H. Oram, D. P. Smith. Ladies Guild: Miss D. E. Colgate, Mrs. J. Summerhayes. Lancashire Assn. : C. Crossthwaite, D. R. Jones, J. P. Partington, F. Reynolds. Leeds University Soc. : A. M. Glover. Leicester Dioc. Guild: J. M. Jelley, B. G. Warwick. Lincoln Dioc. Guild: G. E. Feirn, D. A. Frith, J. L. Millhouse, P. Reynolds. Llandaff and Monmouth Dioc. Assn. : Mrs. D. J. King, M. J. Pryor, T. M. Roderick. London County Assn. : H. W. Rogers, Mrs. O. L. Rogers, J. M. Weddell, D. Woodward. Manchester University Guild: M. C. W. Sherwood. Middlesex County Assn. and London Dioc. Guild: F. T. Blagrove, T. J. Lock, C. H. Rogers, B. C. Watson. National Police Guild: N. S. Bagworth. N. Staffordshire Assn. : R. S. Anderson. Norwich Dioc. Assn. : H. W. Barrett, M. Cubitt, F. N. Golden, N. V. Harding. Oxford Dioc. Guild: J. C. Baldwin, W. Butler, N. J. Diserens, P. Walker. Oxford Society: F. A. H. Wilkins. Oxford University Soc. : J. E. Camp. Peterborough Dioc. Guild: C. J. Groome, J. M. Tyler. Railwaymen’s Guild: E. J. Franklin. St. David’s Dioc. Guild: J. Prytherch. St Martin’s Guild: R. W. Pipe. Salisbury Dioc. Guild: M. Hiller, E. J. Hitchins, G. S. Morris, B. J. Woodruffe. Scottish Assn. : Miss K. M. H. Branson. Shropshire Assn. : Mrs. E. Stevens. Soc. of Royal Cumberland Youths: J. S. Barnes, D. Beresford, W. H. Dobbie, D. E. Sibson. Soc. of Sherwood Youths: G. A. Dawson. S. Derbyshire and N. Leicestershire Assn. : J. E. Collins. Southwell Dioc. Guild: W. L. Exton, S. Humphrey, R. B. Mills, Mrs. B. N. Reed. Stafford Archd. Soc. : C. F. W. Eyre, C. M. Smith. Suffolk Guild: H. W. Egglestone, C. W. Pipe, Revd. L. R. Pizzey. Surrey Assn. : A. P. Cannon, S. F. W. Kimber, C. F. Mew. Sussex County Assn. : C. J. Champion, G. Francis, Miss J. M. Percy. Swansea and Brecon Dioc. Guild: J. A. Hoare. Truro Dioc. Guild: W. C. Boucher, F. M. Bowers, A. J. Davidson, A. Locke. Universities Assn. : Revd. M. C. C. Melville. University of London Soc. : A. J. Frost. Winchester and Portsmouth Dioc. Guild: A. V. Davis, G. K. Dodd, J. Hartless, R. R. Savory. Worcestershire and Districts Assn. : D. Beacham, A. C. Berry, W. B. Cartwright, M. D. Fellows. Yorkshire Assn. : R. Brown, W. E. Critchley, W. F. Moreton. There were no representative members of the Chester Dioc. Guild, the E. Derby and W. Notts. Assn., the Midland Counties Guild, the North American Guild, or the North Wales Assn. present. The following will bring up to date the Central Council Collection of Surprise Methods as far as the end of 1973. 1K. Zaporozhye (f) - 34 - 1458 - 56 - 16 - 34 - 1458 - 34 - 5. 2K. Theddlethorpe (f) - 34 - 1458 - 56 - 16.34 - 14.58.14 - 14.5. 3K. Aylesbury (mx) - 36 - 14 - 1258 - 16.34 - 14.58.16 - 16.5. 4K. Brigstock (b) - 38 - 14 - 12 - 1238 - 34 - 3458 - 16 - 7. 5K. Galleywood (f) - 38 - 14 - 12 - 16 - 34 - 58 - 1236 - 3. 6K. Wingates (f) - 38 - 14 - 1256 - 1238 - 14 - 1238 - 56 - 3. 7K. Polesworth (b) - 38 - 14 - 1258 - 36 - 34 - 58.14 - 16.7. 8K. Benefield (b) - 38 - 14 - 1258 - 36.14 - 14.38 - 12 - 7. 9K. Brafield (b) - 38 - 14 - 1258 - 36.14 - 14.38 - 12.56.7. 10K. Byfield (b) - 38 - 14 - 1258 - 36.14 - 14.38 - 1256 - 7. 11K. Castor (b) - 38 - 14 - 1258 - 36.14 - 14.38 - 34.56.7. 12K. Cottesmore (b) - 38 - 14 - 1258 - 36.14 - 14.38 - 3456 - 7. 13K. Corby (b) - 38 - 14 - 1258 - 36.14 - 14.38.12 - 12.7. 14K. Dallington (b) - 38 - 14 - 1258 - 36.14 - 14.38.12 - 1256.7. 15K. Deene (b) - 38 - 14 - 1258 - 36.14 - 14.38.12.34 - 7. 16K. Denford (b) - 38 - 14 - 1258 - 36.14 - 14.38.12.34.12.7. 17K. Ashwell (b) - 38 - 14 - 1258 - 36.14 - 14.38.12.34.56.7. 18K. Duston (b) - 38 - 14 - 1258 - 36.14 - 14.38.12.56.12.7. 19K. Ecton (b) - 38 - 14 - 1258 - 36.14 - 14.38.1256 - 12.7. 20K. Glinton (b) - 38 - 14 - 1258 - 36.14 - 14.38.1256 - 1256.7. 21K. Lowick (b) - 38 - 14 - 1258 - 36.14 - 14.38.56.12.56.7. 22K. Guilsborough (b) - 38 - 14 - 1258 - 36.14 - 14.38.56.34 - 7. 23K. Maxey (b) - 38 - 14 - 1258 - 36.14 - 14.38.56.34.56.7. 24K. Roma (f) - 38 - 14 - 56 - 16 - 34 - 1258.34 - 14.5. 25K. Over (f) - 38 - 14 - 56 - 16.34 - 14.58 - 12 - 5. 26K. Dymchurch (f) - 38 - 14 - 56 - 16.34 - 34.58.12 - 14.5. 27K. Idbury (b) - 38 - 14 - 58 - 16 - 14 - 1258 - 12.36.7. 28K. Xalanga (b) - 38 - 14 - 58 - 16 - 14 - 38.56 - 36.7. 29K. Tewin (b) - 38 - 14 - 58 - 16 - 14 - 58 - 12.36.7. 30K. Halesworth (d) - 38 - 14 - 58 - 16 - 34 - 38.14 - 14.5. 31K. Ashmansworth (d) - 38 - 14 - 58 - 16 - 34 - 58 - 36 - 3. 32K. Whaddon (a) - 38 - 14 - 58 - 16.34 - 34.1258 - 16 - 5. 33K. Fotheringhay (a) - 38 - 14 - 58 - 36 - 14 - 58 - 36 - 5. 34K. Piddington (b) - 38 - 14 - 58.12.36.14 - 14.38 - 12.56.7. 35K. Pitsford (b) - 38 - 14 - 58.12.36.14 - 14.38 - 1256 - 7. 36K. Ringstead (b) - 38 - 14 - 58.12.36.14 - 14.38 - 34 - 7. 37K. Rushton (b) - 38 - 14 - 58.12.36.14 - 14.38 - 34.56.7. 38K. Stanwick (b) - 38 - 14 - 58.12.36.14 - 14.38 - 3456 - 7. 39K. Badby (b) - 38 - 14 - 58.12.36.14 - 14.38 - 56 - 7. 40K. Sulgrave (b) - 38 - 14 - 58.12.36.14 - 14.38.12 - 12.7. 41K. Towcester (b) - 38 - 14 - 58.12.36.14 - 14.38.12 - 1256.7. 42K. Isham (b) - 38 - 14 - 58.12.36.14 - 14.38.12.34 - 7. 43K. Twywell (b) - 38 - 14 - 58.12.36.14 - 14.38.12.34.12.7. 44K. Brackley (b) - 38 - 14 - 58.12.36.14 - 14.38.12.34.56.7. 45K. Wadenhoe (b) - 38 - 14 - 58.12.36.14 - 14.38.12.56.12.7. 46K. Wansford (b) - 38 - 14 - 58.12.36.14 - 14.38.1256 - 12.7. 47K. Warmington (b) - 38 - 14 - 58.12.36.14 - 14.38.1256 - 1256.7. 48K. Belton (b) - 38 - 14 - 58.12.36.14 - 14.38.56 - 56.7. 49K. Weekley (b) - 38 - 14 - 58.12.36.14 - 14.38.56.12 - 7. 50K. Weldon (b) - 38 - 14 - 58.12.36.14 - 14.38.56.12.56.7. 51K. Wollaston (b) - 38 - 14 - 58.12.36.14 - 14.38.56.34 - 7. 52K. Woodford (b) - 38 - 14 - 58.12.36.14 - 14.38.56.34.56.7. 53K. Upton Snodsbury (b) - 38 - 1456 - 56 - 16 - 12 - 58 - 16.34.5. 54K. Brington (b) - 38 - 1458 - 12 - 36.14 - 14.38 - 12 - 7. 55K. Chacombe (b) - 38 - 1458 - 12 - 36.14 - 14.38 - 12.56.7. 56K. Cosgrove (b) - 38 - 1458 - 12 - 36.14 - 14.38 - 1256 - 7. 57K. Cottesbrooke (b) - 38 - 1458 - 12 - 36.14 - 14.38 - 34 - 7. 58K. Creaton (b) - 38 - 1458 - 12 - 36.14 - 14.38 - 34.56.7. 59K. Empingham (b) - 38 - 1458 - 12 - 36.14 - 14.38 - 3456 - 7. 60K. Exton (b) - 38 - 1458 - 12 - 36.14 - 14.38 - 56 - 7. 61K. Glaston (b) - 38 - 1458 - 12 - 36.14 - 14.38.12 - 12.7. 62K. Greetham (b) - 38 - 1458 - 12 - 36.14 - 14.38.12 - 1256.7. 63K. Harringworth (b) - 38 - 1458 - 12 - 36.14 - 14.38.12.34 - 7. 64K. Helmdon (b) - 38 - 1458 - 12 - 36.14 - 14.38.12.34.12.7. 65K. Kelmarsh (b) - 38 - 1458 - 12 - 36.14 - 14.38.12.34.56.7. 66K. Kings Cliffe (b) - 38 - 1458 - 12 - 36.14 - 14.38.12.56.12.7. 67K. Langham (b) - 38 - 1458 - 12 - 36.14 - 14.38.1256 - 12.7. 68K. Mears Ashby (b) - 38 - 1458 - 12 - 36.14 - 14.38.1256 - 1256.7. 69K. Newnham (b) - 38 - 1458 - 12 - 36.14 - 14.38.56 - 56.7. 70K. Paulerspury (b) - 38 - 1458 - 12 - 36.14 - 14.38.56.12 - 7. 71K. Potterspury (b) - 38 - 1458 - 12 - 36.14 - 14.38.56.12.56.7. 72K. Whilton (b) - 38 - 1458 - 12 - 36.14 - 14.38.56.34 - 7. 73K. Whissendine (b) - 38 - 1458 - 12 - 36.14 - 14.38.56.34.56.7. 74K. Unthank (b) - 38 - 1458 - 56 - 16 - 12 - 1458 - 36 - 7. 75K. Billingshurst (d) - 38 - 1458 - 56 - 16 - 34 - 1458 - 14 - 5. 76K. Theddingworth (b) - 38 - 1458 - 56 - 36 - 12 - 1258 - 16 - 7. 77K. Swannington (b) - 38 - 1458 - 56 - 38 - 12 - 1258 - 16 - 3. 78K. Melbourn (j) - 56 - 14 - 56 - 38 - 14 - 58.12.36.12.7. 79K. Broughton Astley (a) - 56 - 1458 - 56 - 38 - 14 - 58.14 - 14.7. 80K. Bruges (f) - 58 - 14 - 56 - 36.14 - 14.58 - 12 - 5. 81K. Danum (mx) - 58 - 14.58 - 58.16 - 12 - 58 - 34 - 3. 82K. Pitsmoor (mx) - 58 - 14.58 - 58.16.34 - 12.58.12 - 12.3. 83K. Tenterden (c) - 58 - 1456 - 1258 - 16 - 34 - 38 - 16 - 1. 84K. Launcells (d) - 58 - 16 - 12 - 1236 - 34 - 3458 - 14 - 7. 85K. Sandhurst (c) - 58 - 16 - 56 - 38 - 34 - 1238 - 14 - 7. 86K. Birchington-on-Sea (b) - 58 - 16 - 58 - 36 - 14 - 1238 - 12 - 7. 87K. Waterloo Tower (b) - 58 - 16 - 58 - 36 - 14 - 1238 - 34 - 7. 88K. Quex Park (b) - 58 - 16 - 58 - 36 - 14 - 1238 - 56 - 7. 89K. St. Andrews (a) 34 - 34.16 - 58 - 38.14.78.14.58.36.12.36.1. 90K. Abthorpe (f) 34 - 38.14 - 12 - 38 - 14 - 58.16 - 12.7. 91K. Chertsey (mx) 34 - 38.16 - 56 - 38.14 - 12.38 - 12.36.1. 92K. Uffculme (mx) 36 - 56.14.58 - 58.36 - 34 - 58.16 - 16.3. 93K. Wiveliscombe (mx) 36 - 56.14.58 - 58.36.12 - 12.38.14 - 14.3. 94K. Broadclyst (mx) 36 - 56.14.58 - 58.36.12 - 34.58.16 - 16.5. 95K. Seagrave (b) 38 - 38.16 - 56 - 38.14 - 12.38.16 - 12.3. 96K. Durnovaria (b) - 30 - 14 - 1250 - 3670 - 14 - 58 - 16 - 70 - 18 - 9. 97K. Verona (b) - 5T - 16 - 5T - 38 - 147T - 50 - 169T - 70 - 18 - 7T - 12 - E.
Abthorpe 13 -10 - 73 Easton Neston 90K. Ashmansworth 26 - 4 - 73 Highclere 31K. Ashwell Rung in Spliced 17K. Aylesbury 24 -11 - 73 Meldreth 3K. Badby Rung in Spliced 39K. Barnwood 10 - 3 - 73 Barnwood 45F. Belton Rung in Spliced 48K. Benefield Rung in Spliced 8K. Billingshurst 27 - 7 - 73 Billingshurst 75K. Birchington-on-Sea 7 -10 - 73 Quex Park 86K. Brackley Rung in Spliced 44K. Brafield Rung in Spliced 9K. Brigstock 25 - 8 - 73 Quorn 4K. Brington Rung in Spliced 54K. Broadclyst 10 - 3 - 73 Finedon 94K. Broughton Astley 31 -12 - 73 Broughton Astley 79K. Bruges 23 - 2 - 73 Meldreth 80K. Byfield Rung in Spliced 10K. Castor Rung in Spliced 11K. Chacombe Rung in Spliced 55K. Chertsey 18 - 9 - 73 Bushey 91K. Corby Rung in Spliced 13K. Cosgrove Rung in Spliced 56K. Cottesbrooke Rung in Spliced 57K. Cottesmore Rung in Spliced 12K. Creaton Rung in Spliced 58K. Dallington Rung in Spliced 14K. Danum 10 - 2 - 73 Doncaster 81K. Deene Rung in Spliced 15K. Denford Rung in Spliced 16K. Duston Rung in Spliced 18K. Dymchurch 7 - 8 - 73 Appledore (Kent) 26K. Ecton Rung in Spliced 19K. Empingham Rung in Spliced 59K. Exton Rung in Spliced 60K. Fotheringhay 27 -12 - 73 Rothwell 33K. Galleywood 22 - 9 - 73 Galleywood 5K. Glaston Rung in Spliced 61K. Glinton Rung in Spliced 20K. Greetham Rung in Spliced 62K. Guilsborough Rung in Spliced 22K. Halesworth 3 - 2 - 73 Meldreth 30K. Harringworth Rung in Spliced 63K. Helmdon Rung in Spliced 64K. Idbury 1 -12 - 73 Kingham 27K. Isham Rung in Spliced 42K. Kelmarsh Rung in Spliced 65K. Kings Cliffe Rung in Spliced 66K. Langham Rung in Spliced 67K. Launcells 8 - 9 - 73 Hook Norton 84K. Leckhampton 31 - 3 - 73 Leckhampton 74C. Lowick Rung in Spliced 21K. Maxey Rung in Spliced 23K. Mears Ashby Rung in Spliced 68K. Melbourn 7 - 9 - 73 Meldreth 78K. Newnham 11 - 4 - 73 Ashtead 69K. Over 24 - 2 - 73 Over, Cambridgeshire 25K. Paulerspury Rung in Spliced 70K. Piddington Rung in Spliced 34K. Pitsford Rung in Spliced 35K. Pitsmoor 31 - 3 - 73 Handsworth (Yorkshire) 82K. Polesworth 17 -12 - 73 Whitwick 7K. Potterspury Rung in Spliced 71K. Quex Park 9 - 9 - 73 Quex Park 88K. Ringstead Rung in Spliced 36K. Roma 2 - 2 - 73 Meldreth 24K. Rushton Rung in Spliced 37K. St. Andrews 15 - 3 - 73 St. Andrew-the-Great, Cambridge 89K. Sandhurst 14 -11 - 73 Benenden 85K. Seagrave 28 - 7 - 73 Finedon 95K. Stanwick Rung in Spliced 38K. Sulgrave Rung in Spliced 40K. Swannington 31 -10 - 73 Loughborough Bellfoundry 77K. Tenterden 13 -10 - 73 Tenterden 83K. Tewin 21 - 7 - 73 Burton Latimer 29K. Theddingworth 26 - 9 - 73 Loughborough Bellfoundry 76K. Theddlethorpe 3 - 6 - 73 Milnrow 2K. Towcester Rung in Spliced 41K. Twywell Rung in Spliced 43K. Uffculme 31 - 3 - 73 Woburn 92K. Unthank 3 -10 - 73 Loughborough Bellfoundry 74K. Upton Snodsbury 19 - 8 - 73 Sandbach 53K. Wadenhoe Rung in Spliced 45K. Wansford Rung in Spliced 46K. Warmington Rung in Spliced 47K. Waterloo Tower 23 - 9 - 73 Quex Park 87K. Weekley Rung in Spliced 49K. Weldon Rung in Spliced 50K. Whaddon 17 -11 - 73 Meldreth 32K. Whilton Rung in Spliced 72K. Whissendine Rung in Spliced 73K. Wingates 12 - 5 - 73 Westhoughton 6K. Wiveliscombe 7 - 4 - 73 Benington 93K. Wollaston Rung in Spliced 51K. Woodford Rung in Spliced 52K. Xalanga 5 - 9 - 73 Loughborough Bellfoundry 28K. Zaporozhye 24 - 6 - 73 Hingham 1K. Durnovaria 28 - 5 - 73 Wimborne 96K. Dodford 17 - 2 - 73 Walsall 138G. Feering 14 - 4 - 73 Aston 44D. Jedburgh 7 - 7 - 73 Birmingham Cathedral 139G. Oxfordshire 8 -12 - 73 Aston 134G. Verona 17 -11 - 73 St. Stephen, Bristol 97K.